189 of her closest furpals have come to party with her. having more characters than ever before! BASH "Music to READ By"! Just click on the tune you'd like to listen to while ya read! "KATIE!!! Come ONNNNNNNNNNNNNNNNN!" Riley called... AGAIN! He'd pushed, he'd cajoled, he'd pestered... and she was STILL dragging her paws. Riley sighed loudly as he turned and trudged back to to the far end of the wide porch, where he plopped down in the antique rocker and resumed his paw-drumming on the arm of the old wooden chair. He gradually relaxed, and the rocking chair slowed to a much more leisurely pace, as Riley soaked in the atmosphere around him. He loved coming here.... this was one of his favorite places. The Creole bungalow had stood here on the banks of Bayou Lafourche for over 150 years. Built by a long ago ancestor, it had remained in the family, and had been lovingly cared for through many generations. 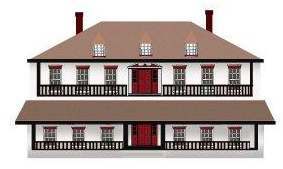 The front of the 'Bungalow' had a wide porch that extended across the entire front of the home. Scattered around the wide veranda sat aged rocking chairs, and at the far end hung a porch swing, all providing a welcoming place to enjoy the peace and serenity of the bayou. Riley took in the view from his rocker. The yard was well manicured, with azaleas and native Iris blooming everywhere. Ancient oaks stood on either side of the bungalow, their huge canopies providing cool shade for the old home. The front yard stretched down to the edge of Bayou Lafourche, where the cypress trees took command..... their branches stretching out over the bayou, draped in the soft, gray whisper of Spanish Moss. Inhaling deeply, Riley took in the smells of the bayou.... the musty aroma of rich, dark soil, the soft fragrance of the honeysuckle... he closed his eyes and listened. Crickets, bull frogs, birds, and the occasional bellow of a bull alligator all added their voices to the vibrant sounds of the bayou. And then, he heard.......the GIGGLE! Riley leaped up from his rocking chair and quickly headed back to the front door, intending to drag Katie out of the Bungalow, one way or another! Throwing a fierce FROWN back over his shoulder toward the yard, Riley yanked open the screen door. "KATIE WILD CHILD, you get out here RIGHT THIS MINUTE!" He added a firm STOMP of his paw on the wooden porch, just for emphasis, then rolled his eyes. He knew it was futile. She would be here in her own time, on her own terms. He turned back toward the yard........and shrugged his shoulders. Propped against the screen door, he leaned forward and pleaded. And then it came to him!!! Smiling wickedly, he added.... "LOOOOOOOOOOOK!" As if on cue, Katie appeared. Strolling leisurely, she was concentrating on the object she held in her paw. Stepping out onto the front veranda, she swung around and faced Riley. Holding the yellow orb up into his muzzle, she asked, "DID YOU bite a hole in MYYYYYY ORB?" "What??? HUH??? Ohhhhhh, THAT!!! Well, uhhhhhhh, yeahhhhhh..... well, I didn't MEAN to. I just got carried away! Ya know how FRAPS are!!!" He heard SEVERAL giggles this time!!! Sighing LOUDLY, he grabbed Katie's paw, swung her around, pulled her toward the front steps, and with a wide, expansive gesture of his paw, he drew her attention to the yard, the gardens, and Bayou Lafourche. "WHAAAAAAAAAAAAT???? You're just trying to change the SUBJECT!" she retorted, pulling the yellow Orb back up to inspect more closely. "Are you an OBSERVANT Scottie??? Can you detect changes in your surroundings? JUST how astute ARE you?" Riley taunted, a wide grin on his face. Katie's demeanor IMMEDIATELY changed. She'd heard the challenge in his voice, she'd heard the teasing dare, and was NOT about to let it go unanswered. Katie focused. Her ears perked forward, her muzzle stretched out to gather any hints that could be carried on the breeze. She tensed, legs stiffened, her back rigid, she was ON THE HUNT! Riley stood quietly beside her.....occasionally glaring FIERCELY into the bayou underbrush. Katie KNEW that Riley was up to something... and she wasn't ABOUT to let him get away with it. This was "sibling SERIOUS" now! She redoubled her efforts, and stared into the lush greenery that surrounded their Bungalow. Nothing was amiss, there were no intruders, she saw no changes. And then she stopped......and turned her head, ever so slightly. 'THAT cypress tree never had a bulge there.' She heard a sudden SPLASH, a muffled gasp.. sounds that aren't normal 'bayou' noises. Quickly, her gaze scanned the area, much more closely now, searching for the slightest anomoly. Then, she began noticing.... pointed ears seemed to be peeking out of bushes, around trees. Fuzzy tushes appeared, as they tried to squirm back into the dense shrubbery. A quick glance to her left even caught sight of one very large muzzle poking between the porch railing!!! Katie smiled broadly..... her gaze moving faster now, watching for 'furfriend' signs! And they were everywhere!! Muzzles, ears, tushies, tails, paws grasping tree limbs... EVERYWHERE!!! Suddenly, the front yard of the Bungalow came ALIVE with activity!!! 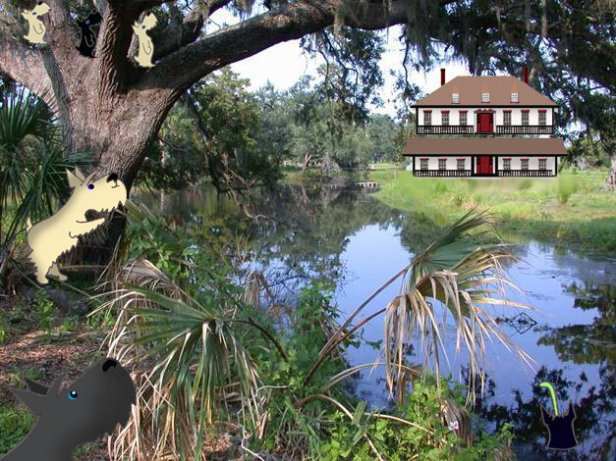 Furfriends exploded from the gardens, the trees, the cypress trees along the bayou... all laughing and cheering!!! Katie smiled happily as she raced down the front steps and greeted her friends on the front lawn of the Bungalow. Hugs were exchanged as everyone began talking at once, anticipating a rowdy, exciting party down on the Bayou. "Okay, okay..... settle down!" Riley raised his paw for quiet. He turned and wrapped his arm around Katie, pulling her to stand beside him. Katie eyed Riley suspiciously. She glanced across the front lawn, at the enormous number of friends who'd made the trip to the Bayous. She knew SOMETHING was up... she tapped her paw impatiently. Riley flashed her a wicked smile, then, motioning for everyone to follow, he led the group down to the bayou's edge. Climbing up onto a cypress stump, he pulled Katie up behind him. "Katie, my dear, wild sister..... you're about to celebrate your 10th birthday. All of our friends are here to help you have the most incredible BASH ever!!!" The BASH guests cheered wildly, quieting only when Riley again raised his paw. "Okay... we've all gathered here to help Katie celebrate her birthday... and we're all used to fun-filled BASH adventures." "What's the plan THIS time, Riley?" asked one of the guests. Riley smiled wickedly. Turning his head slightly, his ears perked at the barely noticeable hum, growing louder as it approached. Riley looked at Katie and grinned broadly. Putting his paw to his lips, he simply said, "SHHHHHHHHHH....... Listen!" Their curiosity aroused, everyone immediately grew still. Heads turned, ears pricked, all trying to catch "the sound". "THERE! There's a hum....coming from upstream, around the bend!" shouted a sharp-eared terrier. Everyone stepped down to the very edge of the bayou, leaning well forward, to peer around the grove of cypress trees that grew along the bank. Then, it appeared.... a long, sleek barge... a PARTY BARGE! The barge chugged along, leisurely making its way toward the bank. As it drew nearer, the Scotties suddenly noticed an old friend standing at the wheel. One paw on the wheel....the other paw raised overhead, waving merrily.... stood Emmitt Bad Boy!! At the front of the barge, readying the bow line, stood Emmitt's brother, O'Reilly Nuckles. Both Scottie lads smiled broadly as they recognized many of their old friends on the shore. The barge gently bumped the near bank, and nestled snugly against a huge cypress tree, where Reilly secured the line. More laughter erupted as Emmitt and Reilly hopped off the barge and greeted their friends, before turning and heading toward Katie! 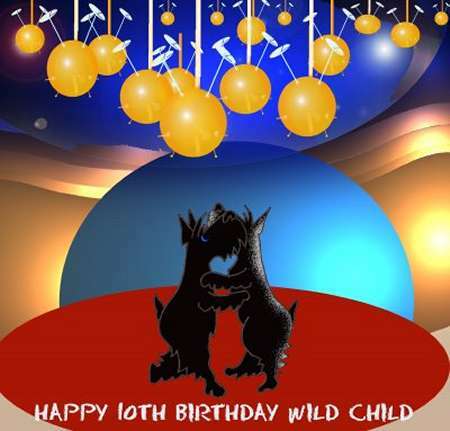 "HAPPY BIRTHDAY, Wild Child!" Emmitt Bad Boy announced. "We couldn't miss THIS PARTY!!" "What's the PLAN, Emmitt?" Bentley Friend asked. "Why the barge?" Emmitt turned to the crowd. "No clue!" he replied. Then, turning to Sir Riley Rambunctious, Emmitt proclaimed, "HE'S the one with the play book! HE'S calling the shots! He asked me to deliver the barge...... and HERE she is! That's all I KNOW!" Everyone's attention moved to Riley, who stood leaning against an ancient cypress, it's roots gnarled and twisted in the soft bayou mud. Katie recognized that wicked gleam in his eye. She crossed her paws, cocked her head 'just so', and gave him her best "Look"! "Okay, brother dear..... spill it! What's the plan??" Katie demanded. "YEAHHHHHHH!! What SHEEEEEEEEE said!" laughed Baxter Tucker. Riley pushed himself away from the cypress tree, and in one giant leap, stood onboard the barge. Motioning to his friends on the shore, he announced, "Ohhh, I'm about to tell you. But, NOT until you are ALLLLLLLL aboard the barge!! Now, get a MOVE ON!!! STEP LIVELY!! COME ON, BASH-ers!! We have an ADVENTURE awaiting us!!!" With another bold sweep of his paw, Riley invited the huge crowd to board the barge. A mad scramble followed, everyone scurrying toward the barge, all eager to begin the adventure. The "Killeen Wild Bunch" border collie puppy, young Peter, tried to use the cypress knee as a short cut to the barge, lost his footing, and ended up in the thick, dark ooze of the bayou. Jake, the collie leader of the Guardian Brigade, quickly reached down and plucked the wet, muddy Peter up, gave him a brisk shake to rid the pup of the mud, and set him down safely on the barge. Looking down at the wee youngster, Jake smiled. "Watch your paws, my lad. You'll have to take your OWN turn with the Guardian Brigade someday. Watch your paws!" And with a parting smile, Jake trotted off, to oversee the loading of the BASH guests. Peter watched the departing collie, a look of awe on his young face. "The GUARDIAN BRIGADE!!!!!!!!!!" he whispered breathlessly to himself. "GOLLY!" Jake made a quick circuit of the barge, making certain that the Guardians were assisting the Elders and wee'est ones onto the 'Party Barge'. As the last BASH guests boarded, the Guardian Brigade positioned themselves around the railing, to insure a safe and leisurely trip down the bayou. Jake felt the rumble of the engine as it started up, and watched as the barge slipped away from the bank and headed downstream at a leisurely pace. He nodded proudly to himself, 'well done, Jake'.. he thought. As his eyes scanned the huge crowd onboard, he glanced toward the port side of the barge, just behind the short ladder that hung over the side...and GASPED! There, perched at the VERYYYYY edge of the barge sat Sunny Riches, Piper Pell, Teddy Sheets, Dickens Burghart, Rippley Meverden, a.k.a. "Psycho Kitten", Phoebe Bruce, Rory Knaub, Campbell Beach, Tosh Sinatra, and his own sister, Tana LAWRENCE! The young adventurers were balancing precariously at the VERY edge of the barge, their wee legs hanging over the side, their paws dangling down into the dark, murky bayou... splashing happily!!! "TANA LAWRENCE!" Jake called between gritted teeth. "WHAT do you THINK you are DOING???" Jake hurried up to the group, with Mungo Connolly, and Eddie "Killeen Wild Bunch" hot on his heels. Reaching the group, he and his Guardians pulled the group back onto firmer and safer seating. Jake took note of the lethal look that Tana threw his way and groaned loudly. He silently threw in a quick "10" count, then casually approached the exuberant group. Leaning against a nearby post, he casually pointed toward the dark, mysterious water beneath their paws. "Whatcha fishing for?" he asked. "LOTS of great choices down there! Snakes, 'gators... BIG 'gators, even alligator snapping turtles! YEP, they'll take your paws right OFF! Hope you're fast on your paws!" Jake watched nonchalantly as Tana and her friends exchanged glances, nodded in agreement, then jerked their paws back out of the reach of the bayou beasts. Noticing Tana's glum expression, Jake reached over into a storage bin and produced several cane poles, held tightly together by miles of tangled lines, corks, and hooks. Handing the tangled mess to the disappointed group, Jake offered alternatives for fun times on the barge. "Okay, gang.... untangle these lines. Be careful of those hooks, they'll GETCHA! Then, when you're all ready, bait your hooks with some of the liver pate on the Treat Table over there." Noticing the upturned noses and frowning faces, Jake added, "Ohhhhhh, and if ya catch the largest fish..... you'll get to drive the BARGE!" Mungo and Eddie exchanged nervous glances. "You're gonna let 'em STEER the barge???" Mungo asked. "Uhhhhhhhhhhh, I know this is my first BASH..... but, is that SAFE??????" Eddie laughed. "Heck, NO, it's not safe!! But, it's a lot safer than YOU and ME having to go DIVING to retrieve 'em from some bayou critter's jaws!!!" Mungo looked down into the dark, bottomless bayou..... and shivered. Jake nodded in agreement, a wicked smile on his face. "WELL SAID, Eddie!! Just a case of the lesser of two evils!! Okay, Mungo... you and Eddie hang around here. Keep this bunch from killing each other with those poles....and for pete's sake, don't let 'em fall IN! I'll be around... keeping an eye on the other BASH guests." Mungo and Eddie, occasionally exchanging glances, spent the next half hour helping to untangle the lines....and baiting hooks, as the barge continued its slow, leisurely way downstream. The BASH guests were enjoying the quiet, peaceful journey down the bayou. Friends were renewing old acquaintences, and catching up on the latest news. Jake made his way back to the refreshment table and was chatting and visiting, casting subtle glances around the deck, when Riley stepped up on a bench and called for everyone's attention. "Okay, BASHers...wait....hey, Katie, get OVER HERE!" Motioning for her to join him, he continued. "BASH adventures are meant to be wild and woolly, hectic and chaotic!" Wild applause erupted from the BASH partiers who crowded around Riley and Katie. "Is this exciting enough for ya???" he asked, his paws spreading wide to take in the slow-moving barge as it moved down the lazy bayou. "NOOOOOOOOOOO!" came the reply from the BASH guests, all eyes glued now to the speaker. "YESSSSSSSSSSSSSSSSSSS!!!" came the response, their eyes sparkling with anticipation. "OKAY, THEN!!! Katie...... for your 10th birthday....we're going to have a SCAVENGER HUNT!!!!!" There was a hushed silence from the BASH guests. A silly ole Scavenger Hunt?? EWWW! Jake's hackles came up... his senses suddenly stirred to full awareness. He just KNEW that the heat on this BASH was about to be cranked up... and that was NEVER GOOD! He listened..... dreading what would come next. Katie, however, saw the gleam in Riley's eye....saw the smirk on his face. Looking at her friends on the barge, she smiled, put her paw to her lips....shhhhhh ......and winked. And the crowd waited. Katie had reassured them. There was MORE!! They knew....with the Wild Child Gang, there was ALWAYS moreeeeeee! "Okay, Okay!!! So ya want a little more SPICE in your Scavenger Hunt, HUH??" MORE wild applause now... with several loud AAARRROOOOOOOO's! Riley was enjoying this!!! He raised his paw for silence.... then offered, "WELL THEN... how 'bout we set the ground rules?!?!?!" "YESSSSSSSSSS!!!" came the excited replies. "First of all, you'll be divided into TEAMS! Your team will work together, with ONE goal in mind...to find the TREASURE item!" Everyone began fidgeting excitedly, glancing around at their friends, wondering who their teammates might be. Reaching down, Riley grasped the handle of a huge picnic hamper. Sitting it down beside him on the nearby Refreshment Table, he threw open the lid, and reached in. Turning back to the crowd, he raised his paws high overhead, displaying a mysterious item in each clenched paw. "To AID you in this Scavenger Hunt, you ALLLL will be equipped with GPS systems, iPhones, and bluetooth earpiece communication.... all compliments of your Parents!!!" Jake groaned.... that was a LOT of technology for some very aggressive adventurers!! Then he paused... he wondered if "the PARENTS" even KNEW about the charges that were being incurred here!!!! The cheering erupted as everyone surged forward, eager to get ahold of their new techno-devices!! What fun!! How EXCITING!!! Many minutes were spent admiring, turning on, and experimenting with their newly acquired toys.... sharing and exchanging ideas and receiving advice from the more experienced 'techno-terriers'. "Heads up, gang! There's MOREEEE!" Riley said, smiling. "Now, WITH your new equipment, you'll be better able to home in on your Treasure item!" "WHY would you need this much technology??? Wellllllll, you're going to be searching a rather wide area!" "Each team gonna get an area of the swamp??" asked Heidi Delli Carpini. Riley paused, then leveled an intense gaze at his friends... and shook his head. "You're thinking too SMALL!!!" he teased. "Let me give you a hint! You'll be given a HEMISPHERE in which to search!!!" Gasps were heard all across the deck. Terriers stared at each other in open-mouthed shock! Zoe Baugh-Riechers literally collapsed against Henry Tucker, who just BARELY caught her before she hit the deck! "Ohhhhhhhhhhh, my ACHING PAWSSSSSSS!!!" Emmitt Bad Boy exclaimed, grinning wickedly. Laughter rippled across the barge as everyone agreed TOTALLY with Emmitt's take on the situation. Katie stared at Riley as if he'd grown two HEADS! "Riley....... WHAT, in this WIDE WORLD, would we EVERRRRRRRRRR have as a 'Treasure item' that would result in our trudging across the entire PLANET?????" "AHhhhhhhhhhhhhhhh, I'm glad you ASKED!" Riley announced evilly. He turned back to the picnic hamper, and flipping the lid back, he reached into the basket. Out came a rich, dark wood box...inlaid with gold corner brackets, and an engraved nameplate on the front. Riley held the elaborate box carefully in his paws. Leaning the box back against him, he reached forward and slowly opened the lid. The BASH guests leaned well forward, all eager to see what this luxurious box contained. 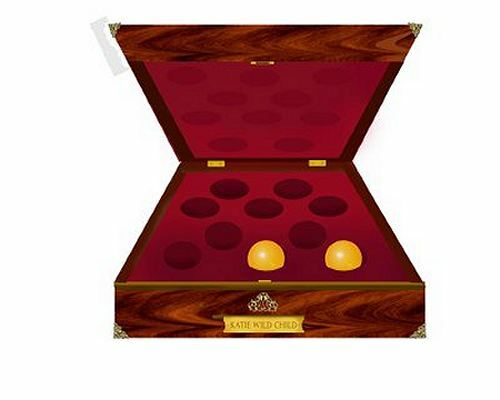 The lining of the box was a sumptuous cranberry velvet. Round indentions covered the bottom of the box, all empty......except for two that sat in the front of the box. Riley reached in and gently pulled out one of the Golden Orbs. He gently laid the orb in his outstretched paw. The BASH guests were mesmerized as they watched breathlessly. Like a magician about to perform the ultimate stunt, Riley extended his paw forward, letting the Orb sit quietly in his flattened paw. With his other paw, he quietly reached for the Orb, and locating JUST the RIGHT place, he added pressure. The BASH guests gasped....all grabbing their bluetooth earpieces simultaneously!!! "That Orb is beeping at my EARPIECE!" Riley's bravado now knew no bounds...quieting his friends, he calmly announced... "This is what you'll be searching for!!" With a sweeping gesture, Riley backed up the crowd and made room for a wide, acryllic table that was placed in the center of the deck. He stepped forward, gently placed ROBO-ORB on the table, then scooped up a large leather briefcase that was propped against a bench. Grabbing Katie by the paw, he led her to the far corner of the party barge, where he sat her down in a comfortable lounge chair. Motioning for everyone to find a seat, Riley waited while the BASH'ers found comfortable places around the deck, many of them sitting cross-legged on the deck. Soon, all eyes were back on Riley, who sat the leather briefcase in Katie's lap. "Now, my dear sister Wild Child... in case you're WONDERING how YOU are going to have any fun, while YOUR FRIENDS are scampering around the world, looking for their ROBO-ORBS..."
Riley glanced around the deck, arched one eye-brow wickedly as he grinned at his friends, then pointed at the lone ROBO-ORB sitting across the deck on the acryllic table. "Katie, m'dear......." Riley leaned down, clicked the latches and flipped open the briefcase that sat in her lap. "YOUUUUUUUUU are going to be CONTROLLING those ROBO-ORBS!!!" "Ohhhhhhhhhhh, my GOSH!!! The ORB Queen is gonna be at the CONTROLS of allllllllll of those hidden ROBO-ORBS?????" Connor Bruce gasped, a huge smile on his face. "A-RROOO - A483", "B-Ware - B294", "C-Tiger - C842" , "D-Stroyer - D113" . The top half of the briefcase held a very sophisticated monitoring system, with the capability to show multiple ORB telemetry images simultaneously at the mere flip of a switch. Riley leaned forward and pointed to a 'test' button on the top left side of the panel. Katie dutifully pushed the button, then followed Riley's paw as he pointed to a miniature 'joy stick' in the center of the control panel. She began twirling the switch... immediately, the ROBO-ORB on the table began responding, following Katie's commands!!! Everyone stared in awe as Katie manipulated the ROBO-ORB. It hopped, it leaped, it turned somersaults.... and as Katie HELD the stick down... the ORB hovered, moving in whatever direction she chose. "SWEEEEEEEEEEEEET!" Katie exclaimed, a huge smile on her face, as she directed the ROBO-ORB into a dive-bomber trajectory toward the seated BASH guests! Squeals and laughter erupted as the Terriers and their friends batted at the ROBO-ORB, that zoomed past, then hovered before pivoting and diving toward OTHERS in the group. Terriers scattered as the ROBO-ORB stalked them, buzzed along behind them, and chased them around the deck. Katie's paw edged forward slowly, to the main buttons at the top of the control panel, then with a grin, she began flipping each ROBO-ORB's button on for a couple of seconds, then switching each off again. Around the deck, sounds of shock and surprise...as everyone's bluetooth earpieces chirped, whistled, or chimed... when certain R-O's were activated!!! "COOOOOOOOL!" Mr. Scotty Tucker exclaimed. "Let's go FIND 'EM!!!" "YEAHHHHHHHHH!! Let us AT 'em!!" agreed Duke Wilson. Mochreigh Reyner, Fiona Walsh, Sam E Williamson, Brody Meadows, Bartholomew van Dulken, Rascal Holland, and Maggie Dee Cleveland sprinted toward the edge of the barge, apparently planning to 'jump ship' in an effort to be the FIRST ashore to begin their search. Jake and the Guardian Brigade immediately began trying to stem the flow... to restore some calm to a now excited crowd of Terriers. Riley stepped forward, put his paws to his lips, and whistled loudly. The rush toward the barge's edge came to a sudden halt, as everyone turned their attention to Riley. "Uhhhhhhhh, a couple of comments here.... how're you planning to get past the 'gators, snakes, and snapping turtles in the bayou to even REACH the bank???" Furry heads turned and peered over the edge of the barge, into the mysteriously dangerous bayou beneath them. "And, in case you've forgotten... your ROBO-ORBS are hidden allll OVER the world. You planning to HIKE????" Laughter erupted as Cammster Meverden quickly piped up with, "Not in THIS lifetime!!! I'll wait for the TAXI... thank you anyway!" Riley continued. "In all fairness, we want all teams to begin on an equal paw... that's why this adventure begins on a barge... to prevent you from sneaking off and getting an unfair start!" Seeing the approving nods, Riley added, "NOWWWWWW, you're probably curious about who your teammates are.... Katie, if you'll make another trip through the ROBO-ORB buttons, please..... one switch at a time." "Teams, when you hear your ROBO-ORB chirping in your earpiece, raise your paw....and meet with your group!!! Katie, HIT IT!" Katie gleefully began flipping switches, one at a time... leaving each one on for 15-20 seconds. She and Riley watched as Terriers all across the deck reacted excitedly. As each ORB began chirping, the teammates for that ORB would throw their paws in the air, arrrooo eagerly, then race to form a united team, chomping at the bit for the contest to begin! Soon, the deck no longer was filled with a solid crowd of BASH guests.... but FOUR separate, tightly packed 'TEAMS', all making faces at the other teams, throwing taunts at their friends on opposing teams, and bragging boldly about their GUARANTEED successes! Riley glanced down the bayou, and saw that they were just rounding the last bend before reaching their destination. He looked back at the wheel and nodded to Emmitt Bad Boy. Riley then moved to stand next to Jake and begin whispering hurriedly. No one noticed Jake's shocked reaction, or the way he jerked his head back at Riley's news. No one noticed Jake's panicked reaction as he desperately gathered his Guardian Brigade together at the bow of the barge. And no one noticed the wide-eyed expressions on the faces of the Guardian Brigade as Jake hurriedly made the Guardian assignments. As the barge rounded the bend, the airport suddenly came into view.... the wide open expanse a marked change from the shady, cypress-lined bayou. The change in environment immediately attracted the attention of the 'TEAMS', who all surged toward the starboard side, nearest the bank, nearest the airport. Riley cleared his throat. "Ohhhhhhhh, one last thing. Your TRANSPORTATION!!! Nooooo, you do NOT have the use of Sleek One! Captain Scotty and the ScotCorde are ready and waiting...... for Katie Wild Child and Webber, and the Elders. They'll be transported to a private island in the south Pacific, where a 5-star hotel awaits them... sunny beaches, cool ocean breezes, and hotel staff to wait on them, hand and paw!! 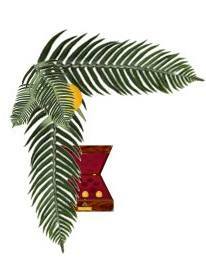 From Katie's lounge chair under the swaying palms, she'll be manipulating your ROBO-ORBS!" Pointing his paw toward the tarmac, Riley announced, "THERE are your rides!" Everyone looked toward the airport. There, sitting in a wide expanse of open tarmac, sat the legendary ScotCorde, shining brightly in the sun, the fabled Scottie silhouette proudly displayed on its tail . Surrounding Sleek One , like spokes in a wheel, sat smaller jets, their noses facing outward from the Queen, all identical, yet smaller, duplicates of the original. Jake jerked his head around and nodded urgently. Immediately, the Guardian Brigade separated... dividing themselves among the ROBO-ORB teams. They desperately made a final check of their Guardian Communicators, making certain that they would be in constant communication with each other. "OUTSTANDING!!!!!!!!!!!!!!" Bo Howatt exclaimed. "We all get our OWNNNNNN ScotCorde-ETTE!! Do we get to fly 'em OURSELVES???" "NOOOOOOOOOOOOOO!" Jake shouted, desperately praying that he was correct. "Nope, Bo....sorry! But Captain Scotty has taken care of the chauffeur duties!! Since he's a retired member of the Blue Angels flight team, he's gathered up some of his flying team for this adventure!!! They're all experienced flying aces, all Blue Angel veterans... they're at your disposal for the duration of your Scavenger Hunt!!! They'll take you ANYWHERE you'd like to go!!!" Riley finished with, "REMEMBER.... your ROBO-ORB will transmit ONLY to YOUR team... at Katie's discretion!! Your search territory includes the Northern AND Southern Hemispheres! FIRST TEAM BACK with their ROBO-ORB... wins their OWN fleet of "ScotCorde-ETTES"!!! Pandemonium broke out... the Guardian Brigade was hard-pressed to keep the BASH guests on board the barge, as each team seemed determined to jump ship, right NOW!!! As if on cue, the barge bumped gently against the bank.... and Riley shouted, "TEAMS.... man your PLANES!!!!!" "LET THE SCAVENGER HUNT BEGINNNN!!!!!!!!!!" Katie and her luxury island pals watched in wide-eyed amazement... it was absolute bedlam! Terriers, Guardians... everyone was racing toward the planes, iPHONES plastered to furry ears, already in communication with goodness-knows whom. Aided by the ROBO-ORB names that were painted on the side of each Cord-ETTE, it only took moments for the crowd to find their assigned plane. As if waving a stick into a hornet's nest, the engines roared to life and the jets all took off simultaneously.... flight lines crossed, jets dangerously close to each other as they veered into each other's path... Katie and her friends gasped as they watched what appeared to be imminent catastrophe!! And, then they were gone....... out of sight, all disappearing for destinations unknown!!! Riley then escorted Katie and the Luxury Team to the ScotCorde, where they were greeted warmly by Captain Scotty. Settling into the chaise lounges in the Main Salon, Katie and her friends relaxed, and enjoyed the view as Sleek One took to the sky, headed for that hidden tropical isle. And, Katie..... well, she was gleefully happy. Her briefcase open in her lap, she was already tweaking ROBO-ORB buttons, turning them on for 2 minutes, then turning them off again. She smiled........ this WAS going to be FUN!!! Malleagh Reyner, Miss Katie Williamson, Ewan Sneath, Maggie Mac Massi, Owen Henrichsen, Megan Wilson, Molly Nixon, and Sherman Sheets were running 'full out'... racing between the smaller jets that surrounded the ScotCorde. The rest of their team was hard on their heels, all frantically searching for 'their' jet! Malleagh, Ewan, and Sherman kept glancing down at their iPHONES. It maintained a constant visual image on the screen... "A483". "LOOOOK for 'A483'! It HAS to be some reference to our JET!" Malleagh shouted into her bluetooth communication device. Teammates immediately responded... acknowledging the information. Sherman had skirted around the nose of one jet, noticed a different number on the tail, and raced off to the next jet on the tarmac. The A-RROOO team was spread out across the tarmac, frantically searching for A483. It was Oliver Gill who spotted it first. "FOUND IT!!! Over HERE!" Oliver screamed into his bluetooth. "Last jet on the right! Southeast corner!!" Oliver sprinted for the jet, just reaching the base of the steps ahead of Django Sinatra, Geordie Tracey, Murdock, Shane Holland, Piper Pell, Fiona Harness, Kelley Lyons, Lucy Smith, and Holly Grant. Together, the Terriers thundered up the stairs, taking the steps two at a time... only to skid to a halt at the top. A tall, uniformed man stood in the doorway, blocking their path. "Uhhhhh, 'scuse me!!! You're gonna get RUN OVER if ya keep standing right THERE!" Oliver suggested breathlessly. "PARDON ME!" Django said, trying to keep from being TOOO rude, and looking for a way AROUND the roadblock. "COMING THROUGH!" shouted Holly, who had a full head of steam up and wasn't about to slow down NOW. And with that, the Terriers ducked around the man's legs, and dashed on into the jet. The uniformed man turned and watched as the excited terriers raced past him, plopped down into the first cushioned seats, and quickly cinched themselves in. Turning his attention back to the tarmac, he quickly realized what the small Terriers had meant. Coming his way, at full throttle, was a gang... a herd... a MASS of small, furry fiends, all intent on reaching the stairs at the same time. Right on their heels raced several VERY large canines, who appeared to be TRYING to maintain some control of the chaotic scene! The uniformed man smiled broadly. He hadn't BELIEVED some of the stories that Cap'n Scotty had told his old flying buddies when he'd enlisted the old team for this assignment. He'd thought Scotty had been exaggerating with those outlandish tales of his!! "Hmmmmmmmm, guess NOT!" he thought to himself with a chuckle, as he quickly stepped back into the jet and ducked into the cockpit doorway just ahead of the furry onslaught that was storming up the stairs. Within moments, the main cabin of the jet was filled with noise, laughter, and exuberant Terriers, all trying to claim the same seats, all eager to begin this unique adventure. The Guardian Brigade team... Haley Gersch, the Giant Schnauzer; Max Bailey, a Yellow Lab mix; Cluny Connolly, a Bouvier; Sammy, of the Killeen Wild Bunch, a Golden/Sharpei mix; and Bear Kaufmann, a Newfoudland mix, were the last to board the jet. Bear, Sammy, and Cluny moved to the center aisle of the cabin, checked the list on their clipboards, then slowly proceeded to cross-check names with the furfaces in each leather-upholstered seat. Their tally completed, the three Guardians nodded to Haley, who took one last look outside, then pulled the door closed, latched it firmly, and turned to the pilot. Introducing the Guardian Brigade team to the Captain, she quickly shared with him what little information she'd been given. "The Terriers have GPS devices, iPHONES, and are to track a telemetry device that resembles an ORB..... errrr, excuse me... a Tennis Ball. The telemetry signal will only be an intermittent signal, so we'll probably have to frequently adjust course." Haley, accustomed to Captain Scotty, was hesitant about this unknown pilot. She watched him closely, her head tilted inquisitively, wanting to like, yet feeling the suspicion well up inside. The pilot smiled broadly, winked at Haley, Cluny, Max, Sammy, and Bear, who were standing between the pilot and their Terriers, then grabbed the intercom mike and introduced himself. "Hello, Adventurers!! I'm an old friend of your Captain Scotty. I am your pilot for this jaunt, I will be your chauffeur, and YOU will point the way! YOU will have to decide our destination!" "NOW... since you're searching for Robo-Orb A483... your team has been designated "Team A-RROOO"... so you can just call me 'Captain A-RROOO'!! I promise you'll enjoy the trip! NOW....we'll get underway... as soon as you give me a direction!!" Capt. A-RROOO crossed his arms, leaned back against the cockpit doorway, and waited. The Terriers began scrambling, turning devices on, comparing data. Sammy Jo Bush, Harmony Devine, Maggie May Bailey, Bonnie Belle Bush, Baby Ruth Donnelly, and Heidi Delli Carpini had their heads together, focusing intently on the 'homing device' that Heidi held in her paw. Nodding in agreement, Harmony announced, "EAST Southeast!!! Robo-ORB's beacon is broadcasting ESE!!!" Team A-RROOO quickly agreed, and loudly began urging Captain "A" to HURRY, to go NOW! Captain "A" smiled, threw a salute to his Team of excited Terriers, then turned and quickly moved into the cockpit. Almost immediately, the jet's engines roared to life, and began easing out onto the runway. Cord-ette A483 tore down the runway and leaped skyward.... heading East Southeast. Hours passed, as the jet continued its journey. Back in the main cabin, Team A-RROOO focused their attention on the wide array of tech devices they'd been given. Breezy Powers, Gracie Graves, Cooper Fones, and Agnes Lucille Donnelly were calculating possible sites along their flight path... trying to anticipate where the Robo-Orb might be hidden. They discounted an ocean search, although they knew from experience that BASH adventures could and HAD gone 'underwater' in previous missions. They were convinced though, that with this flight path, that Europe would probably be their destination.... but they just weren't SURE! They peered across the aisle, where Sammy Jo, Harmony, Maggie May B, Bonnie Belle, Baby Ruth, and Heidi still had their eyes glued to the homing device. Mac Tracey, Rory Knaub, Sir Bubba Kari, and Stewart Collett were draped over the back of the seats in front of the girls, trying to offer THEIR suggestions. Stewart kept insisting that the device was upside down and that they needed to turn it around! A heated discussion soon developed, with everyone certain that they were right....and the others were definitely NOT! Bear rose to intervene, but Haley's large paw reached out and halted the move. "Nah, they're fine. They're just working through some 'stubborn' issues. They'll sort it out!" The two Guardians resumed their chess game, while keeping large ears attuned to the active discussion farther back in the cabin. "HEY, CAPTAIN!!" Stewart called. "A little more NORTH, if you please!!!" The rest of the small group nodded their approval. From the cockpit came the reply, "YES SIR! As you WISH!" And the jet began a slow turn, a little more East than ESE. The team watched the homing beacon intently...and as the plane adjusted its course, the Robo-ORB's beacon strengthened, showing the direction to be right down the center of the screen. "YEP, that's dead CENTER!" Rory announced. "GOOD JOB!" "AWWWWWWWWWWWWWw, man!!! She's done it AGAIN!" Sammy Jo complained. "The signal is gone!! Katie's playing with the switches.... AGAIN!!!" Everyone on the cabin hurried over, all crowding around the homing device, all trying to see the display screen. As they watched, the screen blinked twice, then the homing signal returned, giving a strong signal... only to disappear again a few seconds later. The stuttering signal continued.... and the group groaned in frustration. Mac Tracey suddenly laughed. "LOOK at it!" he ordered. "Katie's tapping out Morse Code!!! Someone get a PENCIL!" Pandemonium broke out as everyone scrambled through the cabin, looking for pencil and paper. Ceilidh Yeager raced back to the group, note pad in paw. "MOVE OVER!" she said, shoving her way nearer the homing device. She began staring intently at the device, stopping occasionally to quickly scribble on the notepad, before returning her attention to the screen. After a moment, she took a deep breath, and looked around at the group, all eagerly watching her. "It's the WC, all right! She gave us a hint!!!! S--W--I--S--S," she announced proudly. "CHEESE?????" Connor Bruce asked, confused. Just then, the homing device went dead. No beacon, no incoming signal.....nothing! Grumbling, the group began discussing the clue and what the WC could have possibly meant by her cryptic Morse Code message. Dozens of suggests were tossed around, but none made any sense. It was Jaimie Sugar who finally shouted, "LOOOOOOOOOK!" Pulling out a GPS device and powering it up, he continued. "Here WE are, just crossing the Atlantic, nearing the French coast. See the blip... that's US! Now.....look!" With his paw, Jaimie drew a straight line, continuing their present course. The group gasped as his paw stopped and began tapping a point just at the top of the screen. "The WC wants us HERE!!!!!!!!" Jaimie announced proudly. "SWITZERLAND!" Frantic scrambling erupted as Annie Belle Currie and Bonny Baugh-Riechers raced forward to the cockpit doorway, where they stopped. Leaning as far forward as they dared, they both began to jabber excitedly. "SWITZERLAND! Take us to Switzerland! First airport ya come to! HURRY!!" they ordered. Captain "A" pushed the throttles forward, full power, and began checking his flight charts for the most practical airport for their purposes. Deciding on St. Moritz, he quickly radioed the tower and announced their arrival within the hour. "Okay, A-RROOO team, we'll be landing in St. Moritz within the hour. You'll have about 20 minutes to check your devices, finalize your search pattern, and organize yourselves for the ground search! I'm required to stay onboard the jet, and may NOT offer any 'ground' assistance... but I AMMMM permitted to offer you ANY assistance you might need...as long as I remain "aerial" !" Haley, Max, Cluny, Sammy, and Bear exchanged nervous glances. This group was about to be released en masse in Switzerland... with no idea WHERE they were headed!! A groan escaped Haley's lips. The Terriers' excitement was palpable as they prepared for landing. Everyone double- checked their devices, making certain that nothing was left behind. Almost before they were ready, the jet began its final approach for landing, and settled softly to the tarmac, where it pulled to a stop at a far corner of the runway. The jet hadn't even come to a full stop, before "Wyoming Beamer", Lady Lizzy Kari, Bentley Friend, and Sweeney Harness had their paws on the cabin doorway and began pulling the safety latch. One final push, and the cabin door swung open, banging loudly against the outside of the fuselage. "WHOA! Wait a sec!!" Haley interrupted. "Bear, go find some transportation... and be quick about it! We'll have the group ready by the jet when ya get back. HURRY"
Bear raced down the ladder that had extended from the plane, and tore across the tarmac. Meanwhile, Haley, Sammy, and Cluny gathered the anxious terriers and herded them down the ladder, where they began grumbling impatiently. Bear soon reappeared, driving an old milk truck, the bottles in the back of the truck clanking noisily as he sped across the tarmac toward the plane. "Don't ask!" he ordered, then began waving the terriers aboard.... waiting only long enough for everyong to grab a pawhold, before speeding off across the runway. "WHERE TO???" Bear shouted over his shoulder. "Can't TELL YET!" Connor shouted back. "Katie hasn't turned the homing beacon back .... wait, there it is!!! Okay..... head off to the right..."
The next hour's drive through the Swiss Alps should have been a relaxing trip with spectacular scenary. On the contrary, everyone was offering directions... GPS devices were consulted, "thata way"..."over THERE"... directions given to poor Bear, who tried his best to follow the instructions. Haley, Cluny, Sammy, and Max had their paws full with their OWN problems, trying to maintain some small sense of calm with the group. Connor, Murphy Beach, Angie Riches, Hot Rod Rammbler, Truman Huckstep, Bailey Doud, Mr. Murphy Williamson, Kioko Gill, Robert(Robbie) of Inverness, Noots Mancuso, Bridie Nixon, Reilly Nuckles, Katie Mac Massi, Maddie of the Killeen WB,Wyoming Archie, Nurse Frosty, and Winston Friend were hanging off the sides of the milk truck, their paws woven tightly into a rope they'd wrapped around the side mirror. Polly Riches, Mayzie Henrichsen, Bohdi Tucker, Carly Rose Beach, Tucker Knaub, Phoebe Bruce, Sam E Williamson, Henry Tucker, and Django were riding atop the truck cab, having a grand time dangling their paws down in front of the driver's windshield.... their beards and eyebrows plastered back against their heads as they stared ahead. The rest of the team was tightly wedged into the front seat, creating MAJOR problems for Bear, who was having a most difficult time steering with all of the wiggling, furry bodies shoved into such a small cab. Everyone staring into the distance, trying to identify a place where a Robo-Orb could be hiding. Connor kept a running commentary on the homing beacon, giving directions that sometimes sent the overloaded milk truck bouncing across pristine pastures, knocking down fences, veering dangerously up steep mountain roads, and ALWAYS jeopardized the trucks ability to remain UPRIGHT. After two LOOOOOONG hours, Team A-RROOO breathed a HUGE sigh of relief when Connor suddenly screamed, "HERE!!! STOP HERE!!!!!" Bear immediately slammed on the brakes. Breaking glass was heard as the bottles of milk being transported in the rear of the truck crashed against the wall. Polly, Mayzie, Bohdi, Phoebe, and Winston slid off the roof, bounced across the hood, and fell into a windblown heap in front of the truck. The Team scrambled out of the truck, and everyone crowded around Connor, eager to get a glimpse of the homing beacon. "THERE!!" Connor's paw pointed to a nearby tunnel that seemed to run alongside the road they'd been using. And the race was on... Terriers tore across the road, down an embankment, and back up a rise... straight into the tunnel. Haley and Bear, hard on their heels, were thankful for their longer legs, which covered the ground much more quickly than the much shorter Terriers... allowing them to reach the tunnel's entrance a slim step ahead of the single-minded Terriers. "HOOOOOOOOOOOLD it!" Haley exclaimed breathlessly. "Connor, get up here with that homing device. Let's see where you're going......."
Holly, peering over Connor's shoulder, interrupted. "IN THERE! We're going in THERE! COME ON, TEAM!!!" It was Holly's loud, heartfelt A-RROOO that took command of the group. The Terriers went into attack mode, and raced full speed toward the dark tunnel. Molly Reyner and Tana Lawrence led a full sprint into the tunnel , paws thumping loudly on the gravel underfoot. Nearing the far end of the tunnel, Connor suddenly skidded to a stop and shouted, "It's MOVING!!! The beacon is MOVING!" Team A-RROOO surrounded the homing device and watched as the blip onscreen began closing on their present position. Confused, they watched as the blip seemed to RACE toward them. Then they heard it..... a distant rumble, growing closer, growing louder. One last glance at the homing beacon showed a blip that was IN the tunnel with them, closing FAST. Cluny glanced quickly at the floor of the tunnel....and gasped. No one argued.... no one questioned Cluny's order. Everyone immediately stepped back against the wall... and as the rumble grew to a roar, they PLASTERED themselves as tightly against the wall as possible. The train tore through the tunnel, seeming to take the very air in the tunnel WITH it as it sped past them out of the tunnel and into the sunlight beyond. "OHHHHHHHHHHHHHHHHH, my GOSHHHHHHHH!!!" Connor screamed. "THERE GOES OUR BLIP!!! It's ON THE TRAIN!" "FOLLOW ME!" Sweeney shouted. She'd been standing at the very opening of the tunnel, and saw what the others hadn't... her eyes shone with a sudden brainstorm! Racing out of the tunnel, the Team looked around at the breathtaking scenery... then realized that they were now standing atop a beautifully-arched railroad bridge that seemed to straddle a vast chasm!! It circled around the mountains, and weaving its way across deep valleys. Sweeney stepped to the VERY edge of the tall railroad bridge, pointed down below, and smiled. 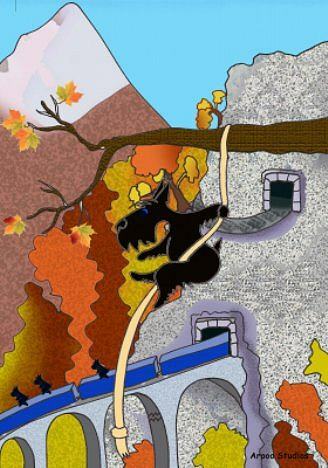 The Terriers leaned forward and peered over the edge of the bridge... into thin air! Beneath them, 1,000 feet below, ran the railroad tracks!! Following the rails back, they saw that the railroad wove its way around the far peak, then doubled back as it descended to the valley floor. "We're going to RAPPEL down and land atop the train when it comes back through!!!" Sweeney announced, a broad grin on her face. "COOOOOOOOOOOOL!" Lady Lizzy squealed eagerly. "ALLLL RIGHTTTTTTTTTTTT!" Stewart exclaimed, stepping even closer to the edge of the bridge. Sweeney, on a roll now, turned and began snapping out orders. "Stewart... Jaimie, there is a huge metal bin back there just outside the tunnel. It probably has railroad equipment stored there. Find us a rope!" "Annie Belle, you, Morley Reyner, Logan Chapman, and Mayzie run back to the milk truck! Cut the seat belts out, we'll need them. Bohdi, you and Oliver go with 'em... pull the tires off the truck... we'll cut the tires into strips! We'll need these for harnesses as we rappel down to the train!" "HOLD IT! WHOAAAAAAAA!" screamed Cluny. "NAH, NAH, NAH!!!" Haley, Max, and Bear shouted together. "You're NOTTTTTTTT swinging down a rope 1,000 feet onto the roof of a speeding train!!! OHHHHHHHHHHH, noooooooooooo... nuh unh!" Haley sighed... they were talking to the BACKS of the retreating Terriers!!! She turned.... shook her head at Max and Bear, and motioned for them to follow the group headed back to the milk truck. Stewart and Jaimie returned quickly, lugging an enormous coil of rope. Anchoring one end of the rope to the underside of a crosstie they tossed the coiled rope over the edge of the bridge, then watched it snake its way down into the emptiness below. Annie Belle and her friends soon returned, and in short order, Team A-RROOO had created make-shift harnesses. After much pleading, all Haley and Bear could do was to adjust the harnesses and insure the safety of their terriers as much as possible. Anyone watching the group 15 minutes later would have gasped at the sheer DANGER being played out on a rope, dangling 1,000 feet over a canyon chasm. The entire TEAM slowly slid down the single rope, trying to maintain a safe spacing to prevent falling into a teammate below. Haley and Cluny had insisted on being the first down the rope, with Bear and Max bringing up the rear. Nearing the bottom of the rope, Connor balanced himself precariously, wrapping one leg tightly around the rope, while trying to pull out the homing device with the other paw. "Blip is coming again!!! Train must be just around the far side of that mountain... ya gotta be READY, team!!! Slide as far down here as ya can get!!! We'll only get ONE shot at this........ so when ya reach the bottom of the rope, LEAP off onto the top of the train as it passes!" Haley lowered herself as far down the rope as possible. Yet, even holding onto the last 6 inches of the long rope STILL had her dangling at least 30 feet above the railroad tracks. As she watched the train appear at the far end of the valley, moving toward her, she groaned. This was going to be TRICKY! Time seemed to stand still as she waited for the train to pass beneath her. Looking up the rope, she saw all of the furry bodies clutching the rope, trying to hang on. Looking up at the top of the group, she saw Bear, clutching the rope in one paw.... and GASPED as she realized that Bear was desperately hanging onto a furry body's harness in the other paw!! Frantically, she watched the train close the distance.....closer.......closer. Then, the engine sped by beneath her, and still she waited. As the next car passed beneath her, Haley released the rope... and dropped to the top of the speeding train in a rolling heap, with Cluny right behind her. Jumping to their feet, they began running, trying to stay beneath the rope as the train sped by. "DROP!!!! NOWWWWW!! I'll Catch you...... DROP!!!" Haley called desperately. At a full run, Haley and Cluny maintained their position... catching one furry body, dropping it to the roof to grasp the center roof brace that seemed to run down the length of each railroad car... then racing on, to catch the NEXT falling furchild. There was no time to stop and make SURE that each Terrier had a firm hold of the brace railing before they moved on....Cluny just shouted to each one as she released them... "GRAB the BRACE!" Nearing exhaustion, Haley and Cluny glanced ahead ....and almost panicked. They were fast approaching the end of the train! "BEAR... grab 'em!! Let 'em hang onto YOU!! You and Max have to jump.... NOWWWWWW!" Haley shouted. Bear began sliding down the rope, grasping each furchild by the scruff of their neck and tucking them safely on his back, before hurrying on to the next terrier. Within seconds, Bear and Max had reached the bottom of the rope, took one look at the train below, and turned loose of the rope. Haley grabbed frantically for Bear, clutched a rear paw, and together they rolled across the roof of the last railroad car. Digging her paws in, Haley reached desperately for the center brace.... just managing to stop their momentum at the very last minute. Sitting up, she and Bear exhaled slowly, then began releasing the clenched paws of the terriers that Bear had gathered on the way down the rope. Looking up the train, they saw all of their furkids, scattered the length of the train, all clinging tightly to the center brace. 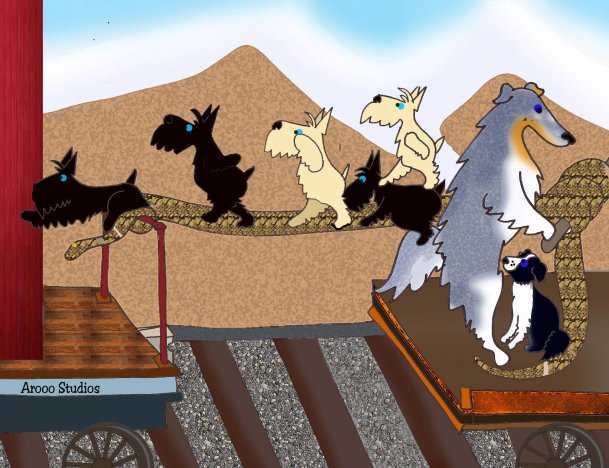 The Guardian Brigade team stood carefully and began gathering up Terriers as they moved toward the front of the train. When Team A-RROOO was fully accounted for and reassembled atop the second railroad, they eased down the ladder between the cars, and slipped into the doorway leading to an empty pullman car. "WELLLLLLLLLLL........ NOW WHAT?" Bear grumbled. Connor pulled the homing device out of his pocket, gazed intently at the display screen... and groaned. "We have GOOOOOOD news....and BAD news!" Connor announced softly, trying to sound optomistic. "The GOOOOOD news is that we KNOW that ROBO-ORB A483 is onboard this train... SOMEWHERE!" "GREAT..... so what's the BAD news???" a windblown Polly asked tiredly. "Uhhhhhhhhh, welllllllll...... Katie turned the HOMING beacon off again!!! So, we'll just have to ride the train and CHILLLLLLLL... until she decides to turn it BACK ON!" Excitement rippled through the Team. They'd closed in on their Robo-ORB, they knew it was here SOMEWHERE! And now, they simply had to WAIT for the Wild Child to reactivate Robo-Orb A483! Nothing to it!!! "SWELLLLLLLLLLLL!" Haley grumbled to herself, as she reached for her MasterCard. "Now to find the conductor.... need to buy 56 TRAIN tickets!" Bear released a loooooong sigh, leaned back against the wall of the pullman car.... and smiled broadly at the thought of a nice, leisurely train ride through the Swiss Alps. "Not a bad way to spend the day!" Bear thought. "LET'S FIND the DINING CAR!" A loud sigh escaped Bear's lips.... "Ohhhhhhhhh, my GOSH! They're OFF AGAIN!" The ScotCorde had delivered Katie WC and her friends to this idyllic tropical paradise just after sunset yesterday. Katie and her friends had enjoyed a sumptuous '5-star' midnight dinner on the veranda of the villa that sat on the bluff overlooking the Pacific Ocean, then had retired to their suites for the night. Katie had awakened early this morning, as usual. Eager to explore the island in the daylight, she'd watched the sunrise from her balcony, then had descended the wide curving staircase that connected her balcony to the beach below. Starting slowly, Katie began walking up the beach toward a huge rocky outcropping at the far end of the bay. As her muscles warmed to the task, she lengthened her stride, enjoying the feel of the cool sand beneath her paws. Faster still, she felt the ocean breezes in her fur as she raced up the beach. She raising her muzzle to take in the smell of the ocean as she sped across the sand. Out of the corner of her eye, she spotted them. Riley, Webber Riches, and Sparcky Tucker were trotting across the beach, not toward HER, but toward the enormous rock at the far end of the beach. "Ahhh, so they think to WIN this race?" Katie thought to herself. With a broad grin, she waved at her opponents, then increased her speed. Sand flew up under thundering paws as the Scotties turned a leisurely morning walk into a typical Terrier contest... Scottie against Scottie. Paws flying, beards pinned back in the wind, the Scotties roared up the beach, all determined to win the race. For whatever reason... planned, contrived, or coincidence... the Scotties all reached the rock at the same moment. Leaning back against the cool rock, the Scotties took in huge gulps of air, then looked at each other and began laughing. "Welllllll, THAT'S ONEEEEEEEEE way to start a day!" laughed Riley. "NOWWWWWW, let's go get some BREAKFAST!" By the time the joggers reached the villa, the rest of the Terriers had awakened and were gathered on the terrace for breakfast. A long, glass table had been set up on the terrace, overlooking the ocean. Crystal goblets of chilled, freshly squeezed orange juice awaited the Terriers, along with a dozen white-jacketed staff members, eager to provide whatever dishes the Terriers might desire. A long, leisurely breakfast was enjoyed by the "Terrier Luxury Loungers" as they'd named themselves. Afterwards, the group moved to the chaise lounges that were set up just below the terrace... on the beach, yet still under the cool shade of the blue and white striped canopy that extended from the terrace. Once everyone was settled and comfortable, Katie waved for 'the case'. A staff member immediately appeared, carrying a round, glass table. Placing the table beside Katie's chaise, the staff member deposited a large briefcase atop the table, bowed to the group, and silently returned to the villa. "WELL NOW! How about a little Robo-ORB beacon BUZZING!!?!!" Katie suggested. The group smiled broadly as Katie opened the case, and powered up the display monitor in the lid of the case. A hum was heard as the satellite telemetry began to sync with the case. Everyone was surprised to see a sheet of paper appear out of an opening on the right side of the case. Katie pulled the paper out, and quickly scanned the document. "All planes have landed at the closest possible airport to their individual search areas. I have seen to it that all Captains have been introduced to the Teams they're transporting... and instructions have been given. All tech equipment is functioning at optimum levels, and I am in constant 'watch mode' with all telemetry. All Teams received steady signals... enough to get them within 100 miles of their targets. You may now add YOUR ASSISTANCE to their search! You can reach me here at the ScotCorde if there is anything you or your friends might need!" "ALL right!" Bravo Belvin laughed. "Sounds like the search Teams might need for us to make it a little more DIFFICULT for 'em, HUH! NO Scottie wants anything to be TOOOOOOO easy!" A devilish grin spread across Bravo's face, as Katie reached over and began adjusting beacon signals.... on for 2-3 minutes, then OFF... everyone had their preferences of Teams that they were SURE needed their 'help'! Laughter floated across the beach, as the group provided some long-distance 'help' for their friends searches. The remainder of the day was spent in luxurious splendor as the group scattered across the beach. Katie, Webber, Billy Delli Carpini, Lucy Sheets, Mz. Jozie Friend, Bravo Belvin, and Mr. Scotty Tucker had spent much of the morning snorkeling along the reef that lay just offshore. They'd taken hundreds of underwater photos of manta rays, zebra fish, clown fish, as well as exquisite coral formations. While the rest of the group continued their underwater explorations, Katie had returned to her chaise, to wreak more havoc on the search Teams. Much of her afternoon was spent making SURE that there would be NOOOOOO constant beacon telemetry for any of the Teams. Katie stretched luxuriously in her chaise, and gazed at the total serenity of the moment. She saw the snorkels of her friends offshore, heads surfacing, then resuming their underwater explorations, with rear paws splashing as they provided momentum. Glancing farther out in the bay, she noticed the two speedboats. Squinting to get a better view, she gasped as she spotted Webber driving ONE boat..... and Riley steering the OTHER speedboat. 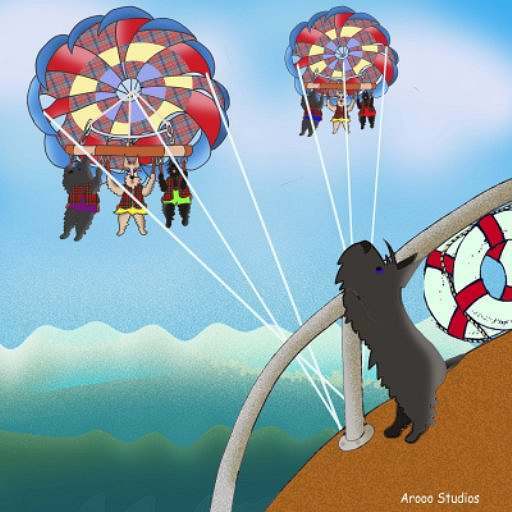 Then, looking ABOVE the speedboats, silhouetted against the brilliant blue sky, she recognized Dusty Truett, Millie Reyner, Dodi Schaus, Maggie Belvin, Sparcky Tucker, and Abby Sagadin..... each one harnessed in and strapped to a parasail!! Webber turned his boat in a wide arc, pulling Dusty, Millie, and Dodi. They deftly manipulated their multi-colored parachutes to catch the air and gain more altitude as they sped across the bay. Riley had taken his speedboat to the far end of the bay, where Maggie, Sparcky, and Abby were practicing their parachute maneuvering skills. They'd become quite good at circling and dipping, and had begun even more challenging acrobatics. Mesmerized, Katie watched the aerial ballet, admiring the grace and beauty as they soared high over the bay. Glancing down at the beach, Katie smiled. Always on duty, sat their Guardian... Molly Pell. The yellow lab sat alertly, eyes on the sky, watching the parasailing with the attention of a true Guardian. Every few moments, Molly's attention would refocus on the swimmers who were snorkeling over by the reef. "Poor Molly," Katie thought to herself. "Everyone is having a grand time... and there she sits...Guarding!" But, then Katie noticed it... Molly was sitting in the sand, facing the ocean, ears alert, eyes peeled... but there was that Lab tail, lying in the sand. Katie smiled. Molly was having a GRAND time... and it was the tail that was betraying her. Every few seconds, the tail would begin to wag furiously, left and right, back and forth... creating a wide arc in the soft sand. Another sigh escaped Katie's lips... sun, brilliant blue sky, brightly colored parachutes floating high overhead, waves lapping up on the beach, breezes blowing, white-jacketed staff to provide ANYTHING one would ever need.... what a way to spend a BIRTHDAY!!! THEN, with a wicked WC gleam in her eye, she leaned to the left, reached over to the table, and turned off the Robo-Orb beacons again! "Andddddddddd," she thought to herself. "The Wild Child controls their BEACONS!" Following the beacon signal, Captain "B-Ware" had deftly set the jet down in Pamplona, Spain... at the far end of the tarmac, out of the way of prying eyes and nosy officials. "Three heads missing", Sorbet muttered. "THIS is starting out well!" Turning to Bear, she raised her eyebrows, mouthed silently "3 missing"... then turned back to check the jet, ONE MORE TIME! Bear turned and quickly located the third member of the Guardian Brigade unit for this team. Eddie, a retired racing Greyhound and a member of the Killeen Wild Bunch, was working the outer perimeter, sprinting back and forth to dissuade the over-eager Terriers who were trying to head out on their own. Eddie watched Bear close the distance to his location, noticed the grim expression on her face... "Uh oh", he thought to himself. "We're NOT ALREADY in trouble.... SURELY!" "You see any Terriers leaving?? Sorbet is 3 short on the count. She's rechecking the plane now," Bear asked. Eddie shook his sleek head. "No, I just left the plane. Had to prevent a couple of 'em from bringing their luggage!! Something about needing more space for souvenirs!" Eddie rolled his eyes dramatically. "No one has left the area since I got out here, but as eager as they are to get MOVING, I'd not be at all surprised. You and Sorbet go check, I'll watch this group!" Bear, DETERMINED not to panic THIS early in the expedition, turned toward the Terriers that were scattered around the tarmac under the jet, and casually scanned the group. Noticing several Terriers standing off by themselves, staring intently toward the airport hangars, she made a bee-line for the suspicious group. Alexander Bradberry, Gingerina Velez, Agatha Bruce, and Brodie Johnson had been the first to exit the plane, and had been standing at the far end of the left wingtip ever since, staring directly between two enormous airplane hangars. "Okay, who's gone? WHERE did they go?? And, WHY??" Bear demanded as she reached the group. "Uhhhhhhhhh...welllllll.... ya see..." Gingerina began. She glanced over at Brodie, Agatha, and Alexander for support. "Transportation!" Agatha blurted out. "YEAH, TRANSPORTATION!" She gave Alexander a look of desperation. "We are in dire need of some sort of vehicular accommodations," Alexander added, "so that we may further pursue our investigations... and since we're not particularly fond of traversing the entire country as piddling, paltry, perambulating pedestrians... we've sent three of our most innovative entrepreneurs out to procure some sort of conveyance for us... hopefully, one that would adequately suit our needs, as we're not fond of sacrificing COMFORT if at all possible." His soliloquy at an end, Alexander took a slow breath, crossed his arms, smiled benignly, arched one eyebrow, and gave Bear a level stare... trying hard not to laugh out loud at the wide-eyed, open-mouthed expressions on his friends' faces. Bear was rendered speechless... but quickly shook it off. "Okay... cut the altiloquence!" Bear retorted, a wicked gleam in her eye. "The pompous pretentiousness simply doesn't become you !" No longer able to control themselves, Gingerina, Brodie, Agatha, and Alexander doubled over, laughing uncontrollably. Bear grinned triumphantly.... then held her paws out, as if to say "well...?" . "They left right after we landed. They oughta be back any min..... HERE they COME!" Alexander announced, spotting 3 figures just emerging from between the two enormous hangars. He frowned. "Where is the vehicle?? The Car?? The bus? The limousine....welllllll, maybe not a limousine! WHAT are they PUSHING???" Brodie asked, as Gingerina thumped him playfully on his arm. Indeed, while there was no MOTORIZED conveyance.... Luckie Laddie Zeigler, Kramer the Bad Boy Bush, and Cammeron Seamus Meverden were strolling back toward the jet. As they neared the group, the chosen means of travel for Team B-Ware became obvious. Laddie, Kramer, and Cammster strolled proudly up to their friends, boldly gestured towards the three two-seater bicycles, and smiled. Gracie Girl Kubicek put her paws on her hips, and frowned. "Boys, SURELY you don't expect ALLLLLL 37 of us to PEDAL across Spain on THREEEEEEEEE 'bicycles built for two'!! "Why NOT?? It'll be FUN! We can see the COUNTRYSIDE better that way!" Linus Smith suggested. He immediately scrambled up on the rear seat of one of the bicycles. "SHOTGUN!" Linus shouted, a bold grin on his face, as he waved his friends toward the bicycles. Alex Glasscock, not to be outdone, hurried to claim HIS space. He planted his furry fanny atop the handlebars directly in front of Linus, wiggled until the metal didn't create QUITE as much discomfort, then nodded approvingly. "BE CAREFUL! Don't DROP me!" Alex called over his shoulder to Linus. And the rush was on. Eddie, Sorbet, and Bear tried desperately to balance the number of occupants of each bicycle, with only limited success. They'd long since given up on trying to talk the Terriers OUT of the bicycles in favor of some sort of 4-wheeled vehicle! Their goal NOW was to simply travel without a bicycle toppling over, dumping the furry mass of riders. Angel(Almost) Schaus had apparently proclaimed herself the Bike Boss of Vehicle 1, and was busily adding bodies to the bicycle... perching Terriers on the shoulders of terriers beneath them. Angel was perched on Bo's shoulders, swinging her rear paws merrily as she continued arranging passengers. "KEEP your FEET still!" Bo ordered. "How in thunder will I EVER be able to steer this contraption if your silly ole frito feet are wagging in my face?!?!" Angel(Almost) dismissed Bo's complaints with a loud "P~~~~~~~~", and proceeded to stack the occupants.... higher and higher. Piper Truett, now riding atop Angel's shoulders, looked down at the ground ... a LONG way down... then gulped and desperately grasped the paw of the nearest Terrier. Someone suddenly leaned too far to the left, and the entire mountain of bodies threatened to topple to the ground. "KEEP STILL!" Piper demanded, not wanting to drop ALLLLLL that way!!! Four high....and 3 wide... there were furry bodies everywhere. Bo Howatt, the driver of Bike 1, was trying to keep his handlebars empty of tushies, claiming that a body would obstruct his field of vision. Zoe Baugh-Riechers dismissed that argument with a careless wave of her paw. "PIDDLE!" she said, as she settled herself onto the cold, metal bars. "I'll just TELL ya when to TURN!!" Sorbet made one last check of the area, making sure everyone was onboard. Looking at the three tandem bicycles, she shook her head. Bo couldn't even SEE from his position on Bike 1. 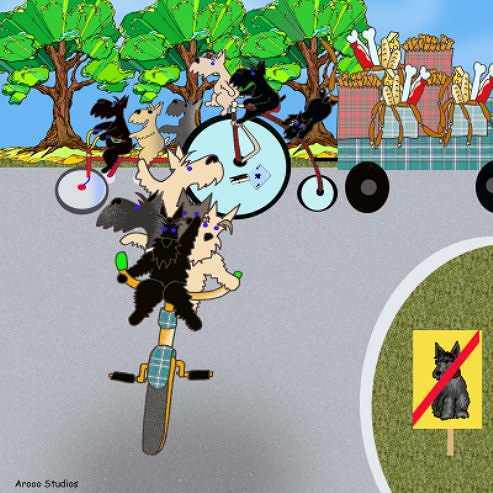 Chak de Mitey, steering Bike 2, had wedged his rear paws on the handlebars to protect his line of sight. Sorbet gasped, and looked down at the pedals. Floyd Johnson was standing on the left pedal, hanging onto the very tip of the left handbar, eagerly watching Trevor Friend, who was putting all of his weight on the RIGHT pedal, and clinging to the very end of the handlebar on THAT side. Maisie Jane Baugh-Riechers seemed to be the see-saw for this team. Sitting on Chak's shoulders, Maisie Jane had one paw on Trevor and another paw on Floyd... apparently planning to push down first ONE Terrier, then the other. "Uhhhhhhhhhh......." Sorbet groaned. "Well, at least they won't be able to pedal TOO FAST!" She moved her attention to Bike 3. O'Henry Donnelly had the bike completely loaded down with bodies, each precariously counter-balanced, trying to maintain the bicycle in an upright position. Laci Massi had one paw around Pagan Mancuso's neck, trying desperately to keep her OTHER paw attached to Delia Duffy's ankle bracelet. Farther up the pile, Willow Clarkson tried desperately to maintain a constant grip on Delia's collar, while clenching a fist full of O'Henry's beard with the other paw. Pagan's occasional gagging sound drew a "sorry 'bout that" from Laci, who would relax her hold... barely. Bear and Eddie joined Sorbet at the rear of the bicycle line. None of the Guardians spoke. They grunted, and with sad shakes of their head, they signaled Bo, Chak, and O'Henry to move out. ONLY after the 3 bicycles began to inch forward, with agonizing slowness, did the Guardians notice the FOURTH vehicle. It was the two-shelf rolling REFRESHMENT cart from the jet... attached to the rear fender of Bike 3 by what looked to be several seatbelts, cut out of the plane, and knotted together! Sitting proudly atop their wobbly cart were Morghie Henrichsen, Duncan Lyons, Bartholomew van Dulken, Odie of the Killeen WB, The MacDughul, a.k.a. Duke Wilson... laughing uproariously and throwing 'Presidential waves' from the clattering cart. Every few seconds, one of the foursome would be forced to lean dramatically in one direction or another, to maintain the cart's upright progress. As the Refreshment cart careened, tottered, and bounced along behind Bike 3, the Guardian Brigade team threw up their paws in defeat. "Dear GUSSIE! We'll be hard-pressed to SURVIVE this adventure!!!" one of the Guardians muttered, as they fell in beside the bicycles......and cart. As the sun set behind the far hill, the odd caravan headed out, tracking Robo-Orb B294. It had been a VERY long night. The B-Ware caravan had struggled through the inky darkness, stopping frequently to check the telemetry and the beacon signal. "It's steady," Agatha announced as she watched the dim glow of the beacon signal. "Looks to be VERY, VERY close....... just over that next hill, I think." Audible sighs of relief could be heard from the mass of Terriers as they gratefully began to scramble to the ground. Sorbet, Eddie, and Bear stood perfectly still for a moment, taking huge, gulping breaths, as the rest of the Team untangled themselves. After several brisk shakes to rearrange ruffled fur, the Terriers began to explore the terrain. Delia, Angus Henrichsen, and Chak had wandered up the gentle slope, hoping to see... SOMETHING, ANYTHING in the thick darkness. Reaching the top of the hill, they stopped.....and stared in surprise. Down in the valley beyond, amid the total darkness, stood an elaborate, well-lit gate. Massive stone pillars stood on each side of the road that led through the gate. Spanning the road, and resting on the pillars on each side, was a heavy wrought-iron archway that seemed to match the double wide iron gates that guarded the entrance. The entire area was bathed in light from mammoth carriage lanterns that sat atop each stone pillar. "Up HERE!" Delia called back to the Team, and within minutes the entire group had joined them at the top of the hill. They stared down at the well-lit gate in an otherwise dark emptiness... then, in a mad dash, they eagerly made their way down to the lighted gate. Team B-ware took in the sheer magnitude of the gate, as they stood in the puddle of light from the giant lanterns. Gazing up at the huge archway that spanned the entrance, Pagan noticed the text, intricately worked into the scrollwork on the arch. "LOOK! It says that this place is called 'Rancho Toro'!" Pagan announced as she gazed at the arch overhead. Not familiar with the language, Pagan merely shrugged her shoulders, considering the name to be insignificant. "The Robo-Orb is in THERE!" Agatha suddenly announced, pointing toward the darkness beyond the gate. "We have to go THAT WAY!" She tucked the beacon locator into her backpack, and after a quick examination of the gate, she wriggled and twisted her way between two scroll-like bars on the enormous gate, and soon emerged on the OTHER side of the gate, inside the protective fence of Rancho Toro. Motioning her friends to follow her, the entire Team eagerly climbed, shinnied, or squeezed through the gate, to continue their quest to follow the beacon. Agatha again consulted the GPS display, the soft glow of the beacon providing the barest of light in an otherwise inky darkness. "This way!" she said, "Eight hundred yards... THAT way!" Motioning out into the dark void, Team B-Ware trotted, sure that they were nearing their destination. Kramer commented on the fact that there were no fences... only the fence line they'd come through that extended past the gate. Bo suggested that perhaps the entire rancho was 'open', needing only the outer perimeter to protect the rancho's occupants. The Team had reached the point designated by Agatha, and had stopped to consider their next step. Everyone was huddling around the GPS device, using the soft blue glow as a tiny lantern. Cammster suddenly turned and thwacked Luckie Laddie on his arm. "QUIT snorting!" he complained. "That's RUDE!" "WHAT???" I'm not snorting! Anyway, YOUR BREATH STINKS! What'd you EAT?" Laddie retorted. The two scotties were warming up to a good old Terrier Sparring session when Linus interrupted. "Okay, who's STOMPING? I can FEEL the ground shaking... who's the 'fat foot'?" he demanded. "........ UHHHHHHH, y'all MAY just want to stand REALLY, REALLY still!" Eddie suddenly ordered. Bear's urgent voice broke through the black night. "FREEEEEZE!" she said through gritted teeth. No one argued. Cammster felt a bump behind him....and turned, expecting to see Laddie's face. Instead, he stared directly into a dark, menacing form. A MASSIVE head, very low to the ground.... a large, wet nose with nostrils stirring up clouds of dust with each angry snort... eyes, narrowed to slits, showing pure venom... one huge front hoof pawing the ground... and a pair of wicked, evil horns,extending out into the darkness. Sorbet reached into her backpack and pulled out her flashlight. Standing with Bear and Eddie, they gathered the Terriers into a very tight mass behind them. Their backs straight, their legs stiff, their tails rigid, they were ready for the beast. Sorbet turned on the flashlight.... to reveal their enemy. Bulls... Spanish fighting bulls!! 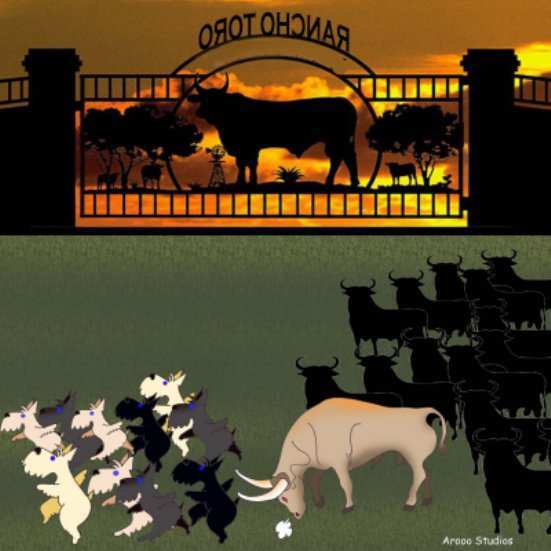 And, as the flashlight beam surveyed the area, they realized it wasn't merely ONE bull........but HUNDREDS of Spanish fighting bulls .... all angry at the intrusion, all focusing on Team B-Ware!! The Team stepped back, VERY slowly... stopping as Bear quietly reminded them...."FREEZE" ! Sorbet's flashlight surveyed the area. To the west and north was a massive herd of bulls, all focusing on THEM! However, as the flashlight beam continued panning the terrain toward the east, it suddenly stopped. Bathed in the flashlight beam was a grove of olive trees, not 50 yards away. Eddie whispered loudly. "That's our destination! We're going to high-tail it to those olive trees. Bear, Sorbet, and I will boost you all up. When you reach the lowest branches, climb HIGHER, as there will be more behind you, wanting up as well. Make sure your telemetry devices are securely stored in your backpacks, as we're about to get REALLY busy!" Bear added, "On the count of three....RUN for the trees!" There was no fear, only excitement, as the Terriers anticipated the race that was to come...and the great beasts who would be HOT on their trail, snorting and pawing! The next five minutes were sheer pandemonium!! Scotties and their pals, running full out... making for the trees. Bear, Sorbet, and Eddie had held their ground as the wee ones raced off.... trying to hold the bulls at bay as long as possible. A glance over her shoulder revealed that the Team had reached the olive grove and were helping each other into the nearest tree. Nodding to the other Guardians, they all turned and raced across the dark field to the tree that the Team had chosen as their sanctuary. Caileigh Fones leaped for the lowest branch. Grasping it frantically, she turned and offered a paw to Gyppsy Rose Kitty, who needed no help at all. Gyppsy Rose Kitty and Rippley Meverden had scampered up the tree with no problem at all... their feline skills coming in VERY handy. 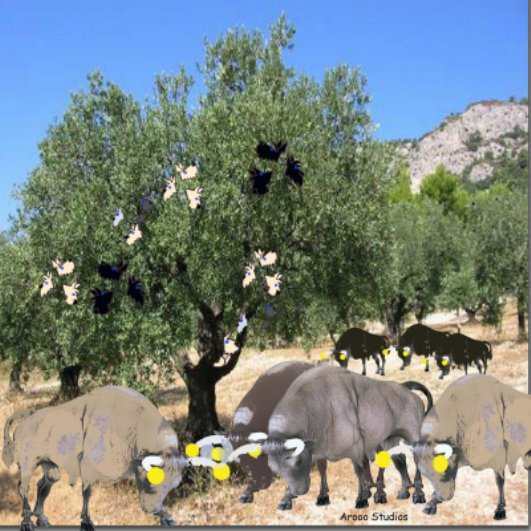 Boosting the last few wee ones into the branches, the Guardian Brigade turned toward the rampaging herd of bulls, made sure that all wee ones were safely in the tree, and threw themselves into the lowest branches of the olive tree just as the angry herd reached the grove. Team B-Ware frantically climbed higher into the olive tree. Each team member soon found a branch or fork in the tree that would provide them a LITTLE comfort, and settled in for what appeared to be a long seige. The Guardian Brigade team, taking the lowest limbs, maintained surveillance on the bulls that now surrounded the tree. "Get some sleep," Bear ordered. "We'll stay here until sunup. We'll be able to formulate a plan then... when we can SEE!" Sighs and groans were heard from the olive tree as the Terriers began to wrap themselves tightly into the branches for the night. Agatha pulled out the beacon device, flipped it on.... and began laughing!!! "WHATTTTTTT?" asked Trevor, who, after bicycles and bulls, wasn't sure he could TAKE much more excitement for one day. Agatha announced proudly, "You'll be HAPPPPPPPPPY to know, the beacon GPS shows this exact position ...... we've found ROBO-ORB B294!!!" Team C-Tiger had had a most relaxing trip. Captain "C-Tiger" had landed their jet at Bordeaux, France, where Libby Timm, Alex Mathisen, Allie Graves, and Campbell Beach had rented a fleet of luxurious stretch limousines for the next phase of their adventure. The drive south through the Pyrenees Mountains had provided the Team with spectacular photo opportunities for the new digital camcorders that Libby, Alex, and Campbell had graciously provided for each team member. Barney Powers and Karey Lawrence were in charge of keeping the Team heading in the right direction. Their focus was on the beacon telemetry and they had been very successful while in flight. However, as soon as they began the overland portion of their search, Katie had begun playing with the beacon signal... sometimes leaving the group without telemetry guidance for up to an hour or two at a time. Dottie Smith, Jordan Massi, and Teddy Sheets had come up with a plan that earned cheers and the total approval of the C-Tiger team. It was decided that every time Katie turned the beacon off, rather than wasting time ASSUMING they were heading in the right direction, the C-Tigers would stop at the nearest restaurant or inn for a meal. So far, they'd visited 3 restaurants, 4 inns, and the home of a very nice lady who'd been baking pies. The Guardian Brigade team for this group, Ruby Massi, a German Shepherd, and Jack of the Killeen Wild Bunch, a Black Lab mix, had spent the last 'food stop' raving about the ease and comfort from this BASH adventure. "Isn't it nice to have a more leisurely BASH this time! No stress, no 'roughing it', just cruising along, eating and relaxing. Just PERFECT!" Jack had bragged. The Guardians had actually had a very easy task with this Team. The only 'chaos' had involved Allie Glasscock, Molly Walsh, Jake Bradberry, Lucile Sagadin, Spike Chapman, Hobbes Devine,Duncan Nixon, Lilly Mitchell, Katie Huckstep, and Bert Williamson. They had spent quite a bit of time during each meal break trying to locate 'souvenirs' of their trip. By the time Jack and Ruby found OUT about their collection, the group had stashed quite a haul into their limousine: a goat, an old oak barrel, some weedy looking plant with an odd-looking orange bloom....that incidentally, had everyone in the limousine sneezing, and the GOAT kept trying to nibble on....., a wooden cart, missing a wheel, that Jake refused to leave behind, and a pig that Bert was ASSURED was an exceptional truffle hunter! Ruby and Jack had FINALLY convinced the group that they'd see that the items would be sent to the jet, and that they COULD take the items home with them. It had taken most of the day for the team to make their way through southern France, across the Pyrenees, and into northern Spain, but the luxurious limousines had made the time pass pleasantly. Many stops, many excellent meals... Team C-Tiger really had it rough! Finally, Barney and Karey had notified the group that the beacon signal was strong, and that they were closing in. The limousines drove them to a dirt road that ran along the north side of an enormous pasture. "HERE!" Karey shouted. "We get out RIGHT HERE!" She and Barney immediately got out of the limousine, sprinted to the white, plank fence that surrounded the field that seemed to go on forever, and crawled under the fence, into the field. Ruby and Jack told the limousine drivers to wait for their return, then gathered the Team and followed Karey and Barney into the field. Karey had her head down, concentrating on the blip that seemed to be coming toward them.... but then veered off toward the south. She and Barney watched as the blip seemed to move aimlessly, but then turned back in their direction, moving fast. "We're out here in the OPEN, this isn't GOOD!" Monte Reyner said, looking around at the large group standing in the open field. Noticing a grove of trees on the rise to the south, he sprinted off in that direction. "This way!" Monte said, as the entire group followed his lead. The distance to the trees was farther than they'd expected, as the Team continued to trot toward the far hill. "Uhhhhhhhh, I think we need to get to the trees.... NOW!" Roxy suggested, as she broke into a run. Scarlet Cleveland wasn't sure WHY she was running, but she followed along right behind Roxy. The ground began to shake beneath their paws, spurring them on to even greater speed. D'Arcy Meadows, Austin Tucker, and Liam King reached the trees first, and began boosting their teammates up into the lower branches. Tosh Sinatra grabbed the branch as D'Arcy almost TOSSED him up into the tree. Once there, Tosh was determined to help. He leaned WAY over, holding the branch by a single paw, as he helped pull the rest of the Team to safety. Ruby and Jack were the last ones into the tree, after making certain that the others were now safely off the ground. They'd completely filled one of the olive trees in the middle of the grove, and now watched intently as the beacon continued to close on their position. Within minutes, the area beneath the trees was overtaken by Spanish fighting bulls, who seemed to be feeling especially fierce this day, as they stood beneath the trees, pawing the ground and bellowing angrily at other bulls nearby. "WELLLLLLLLL, isn't THIS FUN!!!" Maggie Johnson complained. "How are we going to find our Robo-Orb if we're TREED!?!?!" But, then Maggie stopped......and stared. "LOOOOOOK!" she shouted. "ORBS!! LOTS and LOTS of ORBS!!!" Bran Burks added, "YES! On the ends of each horn!!! How COOL!! I bet they're to keep these big boys from hurting each other!!! But, HOW are we going to find OURRRRRRR Orb?" Karey balanced herself on her limb, and checked the beacon... a strong, steady signal lit up the telemetry device, directly beneath them. "Yep," Karen confirmed. "Robo-Orb C842 is directly beneath us...... on one of those huge, evil BEASTS!" Now, it was just a matter of FINDING which Orb......on which Bull!!! But every time one of the Terriers attempted to climb down and grab one of the Orbs, the bulls went into a rage, and attacked the tree, shaking it wildly. Time passed, options were discussed, plans made... and vetoed. Suggestions were made and argued down... and still the bulls maintained a close eye on the grove. Just as the sun set, the herd of bulls began to move off toward the far side of the grove, some bulls began to scatter across the wide pasture. As darkness covered the grove, Team C-Tiger discovered that they could no longer TELL where the bulls were, that their backpacks were safely back at the limousines, and as such would do them NO good here in the olive grove. "Hate to tell ya, Team... but we're going to HAVE to wait until daylight... to even SEE where those huge beasts ARE! So, get comfy .... and for Pete's sake, don't fall out of the TREE!" Jack ordered. The inky darkness of the night seemed interminable... stretching on for hours and hours. It was the flickering flashlight in the distance that brought the group to life. They listened carefully, hearing lots of voices, then they heard the thundering and felt the rumble. They KNEW what THAT was!!! They watched as the flashlight beam raced nearer and nearer to their olive grove, as the rumbling also grew louder. Team C-Tiger was totally intrigued. Everyone stretched as far as they could, curious about who the Fighting Bulls had flushed out THIS TIME. They listened, as the voices grew louder, they were VERY close now. The running shadows had apparently chosen the tree at the other side of the grove, and Team C-Tiger could hear the scrambling as the newcomers joined them in the olive grove. "You'll be HAPPPPPPPPPY to know, the beacon GPS shows this exact position ...... we've found ROBO-ORB B294!!!" "THAT'S AGGIE Bruce! She's with Team B-Ware!" Captain Eddie Zeigler blurted, laughing loudly. "HEY, TEAM B-WARE!! Welcome to our OLIVE GROVE!!! Team C-TIGER is SOOOO PLEASED that you all could JOIN OUR LITTLE PARTY HERE TONIGHT!!!" ARRROOOOOOO's were heard from both trees as the Teams acknowledged each other's presence... accompanied by the stomping and snorting of the angry fighting bulls below. Neither team would be going ANYWHERE this night. They had bodyguards in the grove, stomping and bellowing, making sure that no one left the now-crowded Olive Grove. The day had started badly for Team D-Stroyer, and things had only gone downhill from there. Captain 'D-Stroyer' had been forced to divert to France, due to a sudden storm over the planned landing site. Team D-Stroyer's Guardian Brigade team had been hard pressed to maintain calm and prevent FURTHER mayhem. Jake Lawrence, the Collie Guardian Brigade Commander, Mungo Connolly, the Bouvier, Sadie Williams, the Golden Retriever, and Berry, the Anatolian Shepherd, hadn't had a moment's peace since the flight began! Almost IMMEDIATELY, Jake had discovered that Peter, the 5 month old "Killeen" Border Collie pup, and Dickens Burghart, the 5 month old Scottie lad, had BOTH decided that JAKE would be their designated "hero" for the trip....the ENTIRE trip... every breath, every moment... every paw-step that JAKE took, young Peter and wee Dickens were right behind him. If Jake stopped suddenly, Dickens and Peter immediately slammed into Jake's rear legs. If Jake sat down, he had to FIRST glance behind him... to prevent sitting ON his two very young shadows. Everything Jake did, Dickens and Peter did... which also created huge problems for Jake, who suddenly had to stop and THINK of the consequences of EVERY movement before he acted... fearing that the wee pups would try to mimic his actions and hurt themselves. Jake had spent MOST of the outbound flight trying to find a substitute "idol" for the two pups, to no avail. Mungo had absolutely refused... saying that his breed name, Bouvier, would be too hard for the youngsters to SPELL!! Berry, the Anatolian Shepherd, had offered to 'supervise' the two VERY active youngsters, but Dickens and Peter would have none of it. "Don't mean to be mean, Mz Berry," Peter had explained, his young paw tapping Berry's huge paw sympathetically. "Me 'n Dickens gonna follow JAKEEEE, cuz he's the boss and everybody has to do what he says and we'll get special stuff bein' with the boss and then we'll be there when GOOD stuff happens and we'll see all the 'citement cuz we KNOW its gonna be soooo 'citing... and he likes us helpin' 'im and we're GOOD helpers 'n ....anyway, it's LOTS of fun to run under his legs when he's not lookin'!" Peter took a deep breath. "But you can come follow Jake, TOO. That way Jake will have 'nuff company and we can all help Jake and make his job happy and easy!" Dickens and Peter nodded at each other, proud of their brilliant idea. Smiling, they waited for Berry to agree to their plan. They were SURE she'd want to join their "Jake Fan Club"! They didn't see Jake frantically nodding his head "noooooooo"!! Jake, realizing that he was destined to have some very YOUNG assistants this trip, sighed softly, and accepted his fate. Turning to the wee lads, Jake explained,"No, Mz Berry can't come with us right now. She has to take care of all the OTHERS that need her help. She can come later, okay?" Dickens and Peter accepted that.... and took up flanking positions behind Jake, ready to learn from the "big guy"!!! Elsewhere in the jet, Scotties and their friends were following the beacon and trying to predict their final destination. Darby Yeager, Rumble McGillivray, and Clio van Dulken were focusing on the GPS system, keeping a close eye on the beacon. The fact that it periodically disappeared created wide frustration... but always resulted in laughter as they knew that Katie WC's paw had been at the switches again. The action onboard the plane seemed to be happening at the front of the main cabin, where the Guardians were involved with Dickens and Peter.... and everyone else seemed to be closely watching the small white blip on the telemetry monitor. This provided the PERFECT opportunity for Mochreigh Reyner, Fiona Walsh, Maggie Dee Cleveland, Hurley Coates, Taylor Burks, Maggie May Johnson, Oliver Knaub, Mason Bruce, Rascal Holland, Lucy Collett, Henry Stewart, Heather Tracey,Ceilidy Nixon, Emmitt Bad Boy,	Maggie Sugar, and Ivy Grant, who were excited to begin their adventure, and had slipped to the rear of the jet, where they were making their final modifications to their 'in flight entertainment'... they'd decided that the aft bathrooms would make GREAT swimming pools! The group's theory, sketchy though it was, involved sealing the bathroom door and simply filling the room with water. It was Ivy who pointed out the MINOR problem of how they'd ACCESS their pool, as opening the door would only flood the cabin...and make the Guardians angry! Mochreigh then had a brainstorm. "We'll cut off the top half of the door, fill the bathroom only HALF way up, then we can climb OVER the doorway to go swimming!" The Swimming Pool Squad heartily approved of this idea, and the plans were immediately implemented. Working busily at the rear of the plane, they managed to stay under the Guardians' "radar" for quite some time. By the time they WERE spotted, they'd taken OUT the top 4 feet of the bathroom door, had rounded up every stick of gum on the plane and had caulked the seams around the door with it, and had managed to stretch across far enough to turn the water on in the basin. It was at THAT point that Dickens' attention was drawn to the rear of the plane by the sound of running water... followed quickly by a long, loud "UUUUUUUUUUUUUUUUUUUUUUUUUU!!!" The Guardian Brigade immediately went on full alert, and the rear of the plane became a VERY crowded place, with the Swim Team, the Guardians, and all of the CURIOUS Scotties, eager to know what mayhem had occurred..... or had ALMOST occurred. Berry immediately turned off the water in the bathroom. Then, Mungo and Jake supervised the Swim Team as they cleaned up the water... and the mess. Everyone refused to use that particular bathroom, claiming that they just didn't feel right being able to see over the top of the door from INSIDE the bathroom! The forward bathroom became the only functioning toilet for the remainder of the flight, resulting in long lines.... ESPECIALLY when the 'make-up' lessons started, just after lunch. By the time Captain "D-Stroyer" landed at the alternate airport in France, Jake and the Guardians were worn out. Jake kept stumbling over his 'short shadows'.... and Mungo, Sadie, and Berry were constantly trying to stay one paw ahead of the conniving Terriers who were determined to push the envelope. Team D-Stroyer began their overland portion of their adventure, after Millie Reyner, Margie Mae Velez, and Brody Meadows talked a nearby farmer out of his three hay wagons. When asked WHYYYYYY they were all going to travel across France in HAY wagons, Millie, Margie Mae, and Brody are reported to have said "to absorb the culture"!! Mungo, Berry, Sadie, and Jake..... AND Peter AND Dickens... had several discussions with the Terriers as they were loading the wagons. Janabel Gloris, Sunny Riches, and Lyndi King were trying to 'get in the faces' of the Belgian draft horses that were hitched to the hay wagons, presumably to share a little Terrier Tenacity. Jake...AND Peter.... AND Dickens... managed to pull the girls from UNDER the Belgians' hooves JUST in time. The 3 wagons clattered down dusty roads, through beautiful countryside, with one Guardian atop each wagon, keeping furkids from falling OFF the wagons, keeping the furkids from THROWING the hay, keeping furkids from burrowing INTO the hay, and... on ONE wagon, keeping the furkids from searching for the "NEEDLE" that SOME "wise-mouthed Scottie" SWORE was in the hay! It was late afternoon.....and several hours later... that Team D-Stroyer crossed the border into Switzerland. Darby, Rumble, and Clio had maintained a constant vigil on the ever-flickering beacon. The latest report had it 20 miles to the southeast, MOVING through the snow-covered mountains. It was decided that the group would buy train tickets for the next part of the trip, so Baxter Tucker, Flick Johnson, and Jack MacDonald purchased tickets for the entire Team, then hurried back to the hay wagons to gather the Team. "What time does the train leave?" Jake asked, glancing down to lift a paw to avoid stepping on Peter. "That's the only problem..... ya see, the train pulled out 3 minutes ago, headed through the mountains!" Flick reported. "It's the ONLY train leaving outa here for the next week, so we got the tickets anyway!" "Wait a minute!!" Berry gasped. "Y'all bought dozens of tickets for a train that has already LEFT the STATION!?!?!?!?!?!" Smiling broadly, Baxter and Jack replied, "YEP, sure DID! And the ticket man said if we could CATCH the train, those tickets would be as "good as gold"!! Sooooo, we have our 'catch-up' ride over at the train station.....waiting for us!!! But, we hafta hurry.... because that train's getting farther and farther away!!!" Berry couldn't reply.....she was stunned! Mungo, Sadie, and Jake... AND Peter AND Dickens... were in shock!! Taking command of the situation, Jake signaled to Flick, Baxter, and Jack. "Lead on, let's get this show on the ROAD! MOVE IT!" Still dusting hay out of their furnishings, Team D-Stroyer struggled off of the hay wagons and began sprinting across the small, Swiss village, toward the train station... where they came to a screeching halt. There was no train car, there was no transportation awaiting them... the tracks were empty! Jake turned a steely-eyed glare on the boys. "How are we to CATCH that train?? Where is our transportation?" he asked, dodging a scampering Peter, who was trying to balance on one of the train tracks. Pointing over near an old, run-down storage shed, on a seldom-used siding... Jack announced proudly, "HERE'S our RIDE!" Gasps were heard across Team D-Stroyer!!! Flick and Baxter raced over to the railroad siding and began struggling with a VERY old, VERY run-down railroad HAND	CAR! Pushing it over onto the main track, the boys gestured proudly. "Your carriage awaits!" "WELLLLLLL, come on!" Campbell Donnelly finally groaned, resigning himself to the EXTREME amount of physical exertion that they were about to face. He stepped up on the hand car, took a position at one end of the "see-saw looking" handle, motioned for Duffy Tracey, MacTavish Williams, Mackenzie Clarkson, and Connor Friend to join him. They took their places, grasped the handle firmly in their paws, and with gritted teeth, they glared at the rest of the Team, still standing open-mouthed in the depot. Grumbling and muttering, Team D-Stroyer crowded onto the old railroad hand car. Berry, Sadie, Mungo, Jake .... AND Dickens AND Peter... took up positions at the handle. One last look around, all Team members aboard and accounted for... and they were off. Groaning heavily, Jake and Berry pulled up on the handle, trying to gather speed, but the extreme weight of so many onboard the hand car made it almost impossible to provide enough power to move the decrepit old car. "EVERYBODY!" Berry ordered. "PUMP the handle.... NOWWWWWW!!!" Paws reached for the long handle, as everyone crowded around, some facing forward to raise the handle, others facing backwards to push it down... up and down..... up and down... the groans could be heard as the Team expended enormous amounts of effort. Slowly... slowly... the hand car began to gain momentum. Feeling encouraged, the Team redoubled their efforts, and the old hand car soon began to move at a fairly brisk pace. No one was allowed to rest, no one had a reprieve. All paws were needed to pump the hand car... they HAD to catch the train that was ahead of them somewhere... they had TICKETS for the train! "Get a MOVE ON!!! YOU can do better'n THAT! WHAT are you....... PUHDULZ???" That, in itself, proved to be a HUGE motivator...and the hand car was soon speeding down the tracks, playing catch-up to an unseen train. Hours?? Minutes?? No one knew how long they'd been pumping the old hand car, but no one would quit. Teeth were gritted, eyes were fiercely gazing down the tracks, always straining to see the fleeing train each time they rounded a curve. But, no train was seen...sweat, exhaustion... but no train. It would have been a hopeless chase... had it not been for that last hill. As the Team finally strained to get the old handcar to the top of the snow-covered peak, it slowly... ever so slowly, made its way OVER the summit... and began to LEAP forward on the downhill side of the mountain, heading into the valley far below. Suddenly, Team D-Stroyer was in trouble. The Guardian Brigade scrambled to make sure that all paws were tightly clenching SOMETHING...ANYTHING to hold to!! Faster and Faster they raced... the cold, mountain air burning their eyes, and plastering eyebrows and beards back to their heads. Small Terrier bodies flew like furry, waving flags....hanging on desperately by their front paws, having completely been blown off their paws by the downward speed. And then they saw it...just disappearing around the bend ahead... the train!!!! Darby suddenly screamed, "THE ROBO-ORB beacon! It's MOVING! IT's up AHEAD!!!" It seemed to take no time at all to close the final distance. The old handcar had a head of steam up now, with the weight of so many passengers adding to its downhill momentum. Everyone on board watched as the hand car came closer... closer... closer. Jake saw that the speed was too great...the hand car was going to crash into the rear of the train. He turned, motioned for Berry to grab the huge, rolling duffle bag that Piper Truett had brought to the party... and unzipped the bag. Out popped Newton Truett, a Burmese Python!!! No one even flinched. After airplane swimming pools, hay wagons, and railroad handcars, NOTHING would surprise them!! "WHEWWWWWWWWW!" Newton hissed. "FEELS good to STRETCHHHHH out!!! Whatcha need???" Jake quickly whispered in Newton's... ear?? Yeah, WHATEVER!!! Newton turned, took in the situation in one glance, and with a flick of his tongue, went to work. Just as the handcar reached the rear of the train, Newton stretched forward... forward... a little more.... then wrapped the front part of his body around the outside railing of the last car. His tail firmly circled the handcar's handle and held on. His body pulled the handcar forward until it bumped the train... HARD! "NOW!" Jake screamed. "CLIMB over the railing! We'll go through into the last car!!" Pandemonium broke out!! Berry leaped over the railing and began grabbing the Terriers that Jake and Mungo were trying to help across. Poor Newton became a walkway to the train, but he never complained... not a single hiss was heard from him! Within moments, the handcar had been emptied and Team D-Stroyer was safely onboard the train. They moved into the last car, closed the door behind them, then collapsed in utter exhaustion onto the plush lounge chairs that were scattered around the Observation Car. No one spoke... it would have required too much effort! Not even when the conductor walked through from the car ahead, did anyone speak. Flick and Baxter pulled out 29 train tickets, fanned them out, and waved them at the shocked conductor... who KNEW that there had been no one in this car moments ago!!! Taking the tickets, the conductor scratched his head in confusion and walked away, leaving the exhausted Team to recover in peace. "Welllllllllll," Jake commented, finally. "At least, we caught our TRAIN!! Now, we can relax... and track down the Robo-ORB without ANY fear of being interrupted by another Team." Just then, the door to the Observation Car swung open. In bounced Tana, Holly, Phoebe, Cluny, and Bear. Surprised, they stared at the windblown, exhausted Team. "WELLLLLLLLL, look what WE found!!!" Cluny laughed. " Welcome, Team D-Stroyer... welcome to Team A-RROOO's train!!!! It had been a VERY, VERY long night in the Olive Grove. Team B-Ware, holding firm in the tree at the edge of the grove, stayed in constant communication with Team C-Tiger, who was still homesteading the third tree over... farther into the grove. Actually, 'communication' might not be the correct description of the conversations that were exchanged back and forth between the trees... 'sparring', 'trash talking', or just plain old 'one-ups-manship' might be more accurate. "Bird breath.....", taunted Team C-Tiger. "BEAK face...", quipped Team B-Ware. And it quickly raced downhill from there! The treed Terriers in the Olive Grove could no longer contain themselves..... they broke out in raucous laughter at the rather 'descriptive' compliments they'd traded with each other. FINALLY.... the eastern horizon began to show the barest tinge of daybreak, the first glimpse of a new day. Everyone in the Olive Grove breathed a huge sigh of relief. They were MORE than ready to get on with business, and now that they'd be able to SEE their opponents, it'd be a fair fight!! The Guardian Brigade from both Teams began to exchange ideas about how to best end the current dilemma. They knew that the Terriers would not tolerate this 'treed stand-off' much longer. They KNEW that sooner, rather than later, the Terriers would begin to react much like 'bulls in a china shop' and would be more than willing to 'take the bull by the horns'. The Guardians didn't even want to THINK about THAT confrontation! As they saw it, there were actually TWO problems.... getting out of the trees...... and finding the two ROBO-ORBS. Barney and Karey, concentrating on Team C-Tiger's Robo-Orb beacon, and Aggie, monitoring Team B-Ware's orb blip, had confirmed that BOTH ROBO-ORBS were somewhere directly below them, but were still moving! Only when the sun finally added its warm light on the matter, did the two Teams realize their new problem!!! The herd of fighting bulls beneath them ALLLLLLL had yellow ORBS firmly attached to the tip of each lethal horn, apparently meant to keep the bulls from injuring each other in the huge field. The Terriers stared down at the bulls below, still milling around under the olive trees, still trying to reach the interlopers who'd invaded their pasture. The treed Terriers stared down at the angry bulls, and at the yellow ORBS on the horns of the HUNDREDS of Spanish fighting bulls beneath them. "WELLLLLLLL, we can't just sit HEREEEEEEEEEE for the rest of the BASH!!!" Bo complained. "Are we TERRIERS or are we PUHDULS?!?!?!" he taunted.
" Beacon B294 is strong and steady, and seems to be one of these closest to our tree," Aggie announced, her attention focused on the device in her paw. "Same here.. C842 is beeping loud and clear, within 15 feet of us!" Karey replied. It was Gyppsy Rose Kitty and Rippley, the Meverden c@ts, who finally came up with a workable plan. "We KNOW that the ORBS will move, float, fly, and can maneuver. So, it seems like it'd be very EASY to locate the Orbs by their electronic emissions!" Gyppsy Rose Kitty announced loudly to both trees. "YEAH," Rippley agreed. "Gyppsy and I will scamper across the backs of those bulls, batting off those ORBS on their horns. The orbs MEANT to be on their horns should be very lightweight and will fall off easily. OUR ORBS should be more substantial, and should give off an electronic pulse that Gyppsy and I should be able to detect with our paws. After all, thieves aren't called 'cat burglers' for NOTHING!" It was readily agreed that Gyppsy and Rippley would retrieve the Robo-Orbs, and that once freed from the horns, they should be able to quickly grab them before Katie triggered their mobility buttons, which would make them almost IMPOSSIBLE to retrieve. "Shake the trees!" Gyppsy ordered. "We need those bulls tightly packed in here... we surely don't want to end up UNDER those hooves!" The Terriers began growling and thrashing the limbs of the olive trees, which quickly angered the Spanish fighting bulls beneath them. They held their breaths as they watched the two agile c@ts scamper across the tops of the bulls, popping Orbs off the horns as they went. The now enraged bulls threw their heads backward in an effort to dislodge the beasts on their backs. But, the lithe cats were too fast for them... and soon, the ground beneath the Olive Grove was littered with hundreds of orbs. "HERE!!!" Gyppsy suddenly called. "THIS ONE!" She'd stopped suddenly, and was clutching the bull's horn in one paw, and had the other paw resting lightly atop an ORB, still attached to the horn. She'd felt the static shock as she'd touched the ORB, and now felt the soft hum through her pads. She glanced around, located the nearest tree limb, and calculated the distance. In one smooth motion, Gyppsy yanked the ROBO-ORB off the livid bull's horn, buried the claws of one paw as far into the ORB as the metal would allow, and then made a spectacular leap toward the limb....and safety. Rippley had continued a path across the bulls' backs and had almost reached the far side of the herd... then stopped suddenly. The soft paw pads touched the suspicious ORB lightly, and immediately detected the electronic vibration... a hum that reverberated through the ORB and into the paw. With one swat of his paw, Rippley released the ROBO-ORB from its horn, then latched onto the now-vibrating ORB with a death grip. Realizing, now, that he was dangerously far from the trees and the Terriers who would provide safety, Rippley began to run. Claws out, he dug in, trying to get traction on the backs of the enraged bulls. Leaping, jumping, and dodging, Rippley finally reached the trees, and breathed a huge sigh of relief as black paws suddenly exploded from the trees, to jerk him upwards, into the branches and safety of the Terriers. Both c@ts were having to fight to maintain control of the ROBO-ORBS, who apparently didn't especially like the restraint. 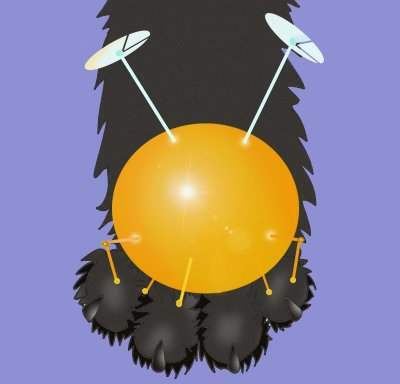 C@ts and Terriers had to provide substantial force to keep the ORBS from escaping... and more than one furry body was suddenly jerked off their paws by the sudden JUMP of the ROBO-ORBS! The Guardian Brigade stepped forward, and, after identifying which ROBO-ORB belonged to WHICH team, safely stored the still-active ROBO-ORBS into backpacks that Bear and Jack strapped to their backs. "THERE!!!! MISSION ACCOMPLISHED!!" Bear said... then looked down to the ground. "Nowwwwwww, how in the world are we going to get out of these TREES???" Minutes passed.... as Terriers and Guardians discarded one suggestion after another. The Guardians simply REFUSED to allow the Terriers to attempt a head-to-head face-off with the enormous Spanish fighting bulls. "WAIT! I have it!!!" shouted Luckie Laddie. He turned and began rummaging through his backpack. He soon raised his paw and declared proudly, "THIS!!!" Luckie Laddie began quickly scanning his iPOD, searching for JUSTTTTTT the right tune. The Terriers' faces revealed their confusion... they had NO idea how an iPOD player would EVER save them from the bulls who'd treed them. CLICK to Hear Laddie's TUNE! The Terriers in the Olive trees laughed out loud as they recognized the tune that Luckie Laddie had selected on his iPOD. With the volume turned up, FULL BLAST, Laddie extended his paw as far out from the tree as he dared....and held the iPOD facing the herd. Everyone waited for the reaction.....and it was immediate!!! As if someone had thrown a wet blanket over their party, the Spanish fighting bulls seemed to lose their anger. Their heads drooped, their demeanor became listless, and almost... LONELY! Still listening to the music blaring from Luckie Laddie's iPOD, the huge herd of enormous Spanish fighting bulls walked forlornly away, totally dejected... and surprisingly, LONELY! Team B-Ware and Team C-Tiger didn't need to be coaxed... they LEAPED down from the olive trees, and after much stretching and posturing, the two teams quickly formulated a plan. Team C-Tiger announced that their limousines were still awaiting their return over the next hill....and offered Team B-Ware the use of one of their limousines. "LIMOUSINES!!?!?!?!?!?!" Team B-Ware barked, as they all thought back to their LONG, arduous journey overland, crammed on the bicycles. "LIMOUSINES?!?!?!?!" Then, laughing out loud, they quickly took advantage of the offer, not wanting to reveal to Team C-Tiger that THEIR rides also awaited them....back in the other direction, back at the main gate... leaning against the gate... their BICYCLES!! The two teams raced across the green field, relishing the feel of the cool grass under their paws...appreciating the open air, and freedom!! The Terriers covered the distance to the far end of the field in record time, as they'd been eager to relieve the cramped muscles from their night in the trees. The Guardians helped the Terriers under the fence, then the Teams separated into the separate limousines, and prepared to head their different directions to rejoin their awaiting jets. Luckie Laddie rolled down the window of the limousine, stuck his head out, and cocked his head, just so. He listened....carefully... and smiled. He'd left his iPOD perched in the lowest branch of that farthest olive tree, blaring the tune that had broken the bulls' hearts. How sad, how unfortunate....for the LONELY BULL!!! Team A-RROOO and Team D-Stroyer had grown tired of waiting, and had joined forces aboard the train. They were systematically searching the train for the elusive ROBO-ORBS, using the sporadic beacon data as clues. Harmony, keeping an eye on the beacon for A483, and Darby, who was watching the D113 blip, both gasped at the same time. Both blips were now broadcasting steady and strong, and seemingly within feet of each other, in the same location. Haley and Cluny gathered up Team A-RROOO and approached the target from the front of the train, while Jake.....and Peter and Dickens... and Mungo and Sadie moved Team D-Stroyer into position, moving forward from the rear of the train. Harmony and Darby stayed in constant communication, comparing blip coordinates and strength of signal. As they closed in on the only remaining car to be searched, the two Teams paused. Both Harmony and Darby confirmed that the signals were, indeed, coming from inside the next car... the baggage car. Bear, Max, Cluny, and Haley had Team A-RROOO at the front end of the car, ready to enter. Sadie, Mungo, and Jake....and Peter and Dickens... were standing at the rear door to the baggage car with Team D-Stroyer. Jake moved Bear and Cluny to the front of the Team, while he....and Peter and Dickens, brought up the rear. Jake was hard-pressed to keep the two very wee ones at the rear of the group, as they seemed determined that Jake LEAD the assault. "Come on, Jake....go get 'em, get up there, we gotta be first, you're da boss, we gotta be first in the door, how we gonna see what's in there if we're at the back!" When Jake firmly shook his head "NO", the two pups responded forcefully. "AWWWWWWWWWWWW, MAAAAAAAAAAAAAAAAAAAAAAAAAN!" Peter and Dickens grumbled, accompanied by a couple of small paws stomping the floor angrily. Jake saw the dejection on the two youngsters' faces, and added, "Well, guys...ya know what they say.... ya ALWAYS leave the best for LAST!" He glanced out of the corner of his eye, to see if the twosome was 'buying into' his explanation. "YEAH......... COOOOOl!" Peter replied. "WEEEEEEEEEEE get to be LAST!" Jake breathed a huge sigh of relief, then made sure that the two were firmly BEHIND him, before giving the signal. Both teams broke through the Baggage room doors simultaneously.... then stopped, and STARED. The train's boxcar, now crammed with over 60 BASH guests and the Guardians for each team.... was filled with ORBS, hundreds of ORBS!! "Ohhhhhhhh, my GOSH!" Harmony groaned. "CLOSE THE DOORS! THEY'RE ROLLING OUT!" Everyone immediately pushed, shoved, and wedged themselves farther into the overcrowded baggage car, slamming the doors closed behind them..... desperately hoping that THEIR Orbs hadn't spilled out through the doorway, to roll down the MOUNTAIN, never to be found again!! In the hot, dark, enclosed space... standing hip-deep in ORBS, both Teams held their breaths as each "blip boss" checked their instruments. Harmony and Darby each had their beacon homing devices pointed into the ocean of ORBS beneath their paws, searching for a signal. "Katie has turned the signal OFF again!" Darby announced through gritted teeth. "It's been flickering on and off now for several minutes, so maybe it won't be off long... see, it's back again!!! D113 is HERE!!! Rear of the car, right hand corner!! DIG!!!" Team D-Stroyer paid no attention to the darkness, the growing heat in the airless space, or the other Team that was in their path. They dove headfirst into the car full of ORBS, searching for one among hundreds! Almost at the same moment, Harmony shouted, "A483... rear of the car, left side!!" "GET IT, A-RROOO!" Harmony screamed. The world has yet to see chaos on such a scale.... I shudder to even ATTEMPT a worthy description!! Furry bodies wriggled down into the car full of ORBS, all searching for the ORB that would guarantee their Team a win. Orbs were being thrown over shoulders as they continued to dig deeper... wrestling matches broke out as opponents fought for the same orb, only to find out that it wasn't "THE ONE"... paws, tushies, noses, ears...all stuck out at the top of the ORB pile....as the Teams dug frantically for the special ORBS. Jake had immediately ordered the Guardian Brigade to hang back. "All the way back against the wall," Jake ordered. "We'd crush a Terrier, so we'll just FISH 'em out as necessary! Keep an eye on 'em, Guardians!! But, watch your paws... you stick it down in that mound of balls with those Terriers, you'll LOSE that paw!!" Jake laughed out loud at his own joke, then, as had become second nature, he turned to check his shadows......and groaned. Dickens and Peter were nowhere to be seen. He KNEW they'd come in with him, as he'd had to forcibly move Dickens out of the door as he'd closed it. He turned and scanned the lake of ORBS, searching for a sign of his two very wee assistants. He didn't mind them being in the ORBS as much as he worried about them getting in the middle of one of the tussles that he could HEAR going on under the surface. "HEADS UP!" Jake called to the pile of ORBS. "VERY wee ones are in there. WATCH your teeth!" "GOTCHA!" called one Terrier. "We'll watch for 'em! OUCHHHHHH!!!!" "They'll be fine!" replied Ivy, who immediately let out a grunt as someone landed on her paw. Jake listened....through the chaos and the noise.... and heard two giggles over on the other side of the baggage car. Focusing in on the laughter, Jake and Mungo finally located the two escapees. Mungo continued to watch the youngsters, as Jake returned to the task of finding the ROBO-ORBS. Harmony suddenly screamed. "It's PULSING!!! FIND one that's PULSING!!!" "OURS isn't!! Ours is glowing... BLUE, according to the blip!" Darby shouted. The two Teams were just about to redouble their efforts, when Harmony and Darby gasped. Rising up above the pile of Orbs were two ORBS... one pulsing with a flickering white light... the other had a constant, blue glow to it. Both Orbs had risen about 5 feet above the floor of the Baggage Car and were simply hovering in mid-air. Both Teams stared in open-mouthed amazement as they watched the two ROBO-ORBS just hang there in space. "GRAB 'EM!" Piper Pell screamed. And, as if on cue, the ROBO-ORBS "attacked"!! They flew toward the Terriers, dove within inches of snarling teeth, then whizzed past, to hover high in a corner of the baggage car. The two ROBO-ORBS seemed to take turns swooping down on the Terriers, before retreating to the rafters again. Each time a ROBO-ORB dove on the Teams, growls, sqeals, and screeches were heard as the Terriers dodged, ducked, and avoided a collision with the device. It was Django who finally found the answer to their problem. Grabbing a backpack and hiding it behind him, Django waited patiently for the ROBO-ORB's next assault. Mac Williams, following Django's lead, also prepared a backpack trap, and waited quietly. The two ROBO-ORBS seemed to know what was about to happen...for, just as they reached the center of the baggage car where Django and Mac were waiting, they stopped.... and just HOVERED. Mac and Django didn't hesitate. They accepted the ROBO-ORBS' behavior as a sign of "we give up", and quickly threw the backpacks over the two devices. Closing the two backpacks securely, the two lads held the backpacks high overhead, and smiled broadly. The Baggage Car erupted in shouts of glee.....both Teams patting each other on the back, for their achievement and effort!!!! "WELLLLLL, now!!!" Darby announced. "LOOK HERE!! The beacon device is flashing a message!!!" Harmony agreed. "Sure is!! It's now telling us 'Last One Home is a PUHDUL'!!!" The Guardians immediately stepped in front of the doors, to prevent the Terriers from bolting out of the car and leaping off the train. Haley, Cluny, and Sadie kept up a steady stream of chatter with the arguing Terriers, while Jake did a quick online check with his iPHONE... and made a couple of phone calls. "Okay, Teams!! Here's the plan!" Jake said finally. Everyone in the now sauna-like baggage car turned and, hassling loudly, listened. "I've contacted both pilots. Captain A-RROOO and Captain D-Stroyer will both be waiting at the train's next stop, in the valley below. We should be onboard and back in the air within 30 minutes! So, we'll just all go back to the Observation Car and enjoy the scenery until our next stop!" Wild cheering erupted as both Teams accepted the peaceful end to this quest. The Terriers breathed in huge gulps of the cool, mountain air as they exited the baggage car and headed toward the rear of the train. "Ya know..." Jake whispered to Haley and Mungo,....."this Guardian Brigade business isn't for the FAINT of HEART!" Despite the logistics of rounding up four Scavenger Hunt Teams, and depositing them aboard four separate ScotCord-ettes... it's just quite interesting that regardless of location, alllllll four jets took off simultaneously.... and just HAPPENED to rendezvous in the clear, blue skies over the South Pacific. Perhaps it had something to do with the LONG friendship that the pilots all shared, or their long years of service as part of Captain Scotty's "Blue Angels" squadron. But, as the planes raced across the sky, headed for an unknown destination, the four sleek supersonic jets seemed to just naturally fall into a Delta-4 pattern, each snuggly tucked into the airspace of the jet next to it. The BASH guests aboard the jets definitely noticed the close proximity of the planes, and were sharing their observations with each other, when a familiar voice came over the intercom. "HELLO, my TERRIERS!! I understand you have all had QUITE an adventure!!!" Captain Scotty said, his deeply resonant voice immediately recognized by all Terriers who'd flown with him on previous BASH adventures. They looked at each other in confusion. "No, sorry...... I'm not there with you!! But, I can assure you that you'll soon be joining us HERE at OURRRRRRRR location, where we PROMISE you'll have a grand celebration." Aboard each Cord-ette, the BASH passengers cheered loudly, eagerly anticipating their next stop on this amazing adventure. They quieted as their beloved Captain Scotty continued. "BUTTTTTT, since I've not been able to be with you this trip, I'd like to give you a little "lagniappe".....a little "something extra"... from my old 'Blue Angel' team," Captain Scotty announced. He then added, cryptically, "Ohhhhhh, I'd suggest you tighten your seatbelts... STRONGLY suggest!" Suddenly, Captain Scotty's voice changed. It became steel-hard, as he spoke to the four pilots of the Cord-ETTES. "Team PLAID, this is SCOT 1. You OWN the AIRSPACE. Have a nice flight!" "Roger that, Scot 1," Capt A-RROOO replied crisply. "We're hot and vertical!" 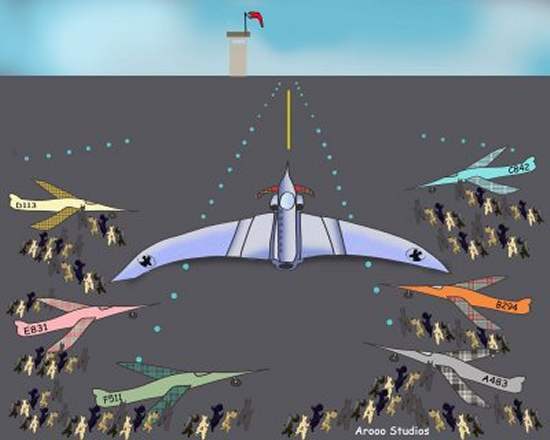 Only a microsecond elapsed, then Captain A-RROOO issued the command to the pilots in the four-jet formation. "Team PLAID, take it VERTICAL.....in 3....2....1....NOW!!!" The Delta Formation moved to purely vertical flight, as the four jets' wings changed configuration, taking a more swept-back appearance, allowing the super-sonic planes to accelerate at an incredible pace. Team Plaid landed, hours later, just as they'd flown the entire trip... in a tight, Delta formation. As soon as the Cord-ETTES pulled to a stop, within mere feet of each other, the BASH guests raced off, jabbering excitedly about G-forces and speed and inverted spirals....and ALWAYS ending with the statement that the flight was MUCHHHHHHHHHH too short!!! The Guardian Brigade, now back to full-strength with the reuniting of the Teams, appreciated the 'strength in numbers' as they tried to herd their over-excited Terriers toward the waiting fleet of convertibles. Only then, did the Terriers remember the purpose of their missions, and turn back to anxiously ask about the ROBO-ORBS. "Relax.....RELAX!" Jake replied, lifting his paw negligently to avoid Peter's tail, as dozens of frantic Terriers began moving back toward the jets, planning to search for the forgotten ROBO-ORBS! He and the other Guardians lifted the four backpacks that held the Scavenger Hunt treasures, and held them high overhead. "They're safe. We've labeled each backpack with the Team designation, so that you'll all be able to present the appropriate ROBO-ORB to Katie. Here ya go......."
And with that, the Teams claimed their ROBO-ORBS, piled into separate convertibles, and settled back to watch the exquisite scenery as they made their way through what apparently was a tropical paradise. The convertibles eventually pulled to a stop in front of an incredible villa which seemed to spread out forever. The ornate marble steps led up to a richly carved doorway that appeared to have been there for centuries. The BASH guests stared in awe at the elaborate beauty of the villa. They eagerly grabbed the backpacks containing their Scavenger Hunt treasures, and sprinted up the marble steps to the villa's entrance, that was immediately opened by a white-jacketed staff member. Impressed now, the BASH guests followed the jacketed assistant through ornate rooms with 20' gold framed mirrors, and walls lined with priceless art. After a long, winding tour of the largest villa any of them had ever seen, the BASH guests finally saw light ahead... bright sunlight streamed in through enormous windows that opened like doors, creating a sitting room that extended outside onto a veranda the size of a basketball court!! NOW, the BASH guests were speechless. They were on a lavish veranda, with wide, marble steps that curved gracefully down to the white, sandy beach below, where chaise lounges sat grouped together under striped umbrellas. They stood in silent amazement, as a white-jacketed assistant marched smartly across the sand, balancing a silver serving tray laden with food and goblets. As he reached the chaise lounge, he sat the tray down on a chairside table, then leaned over and whispered to the occupant of the lounge chairl. Immediately, Katie Wild Child jumped up, turned, and waved excitedly to the BASH guests. Waving them down to the beach, she called the others over....and together, they all greeted the BASH adventurers. The remainder of the afternoon was spent regaling each other with outlandish tales from the Scavenger Hunt. Finally, Riley stood and cleared his throat. "It's time to crown the winning Team," Riley announced. He turned toward the Guardian Brigade, who called the Teams together. Everyone watched in anticipation as the Teams unexpectedly began whispering hurriedly, their heads huddled together. "You sure?" Jake... and Peter and Dickens..... asked. When the Teams nodded unanimously, Jake shrugged and waved them toward Riley. Stepping forward as one, the four Teams presented the backpacks to Riley, laying all four in the sand at his paws. "It was a group project, a Team effort," Aggie said. "We all finished together!" Riley paused, glanced around at his friends, then stole a glance toward the Terrier who was 'bankrolling' the awards... and seeing a smiling nod, Riley added a smile of his own. "WELLLLLLLL, now!!!" Riley announced. "Since you all have finished together, then it's only fair that you all reap the rewards...... Cord-ETTES for EVERYONEEEEEEEEE!" Wild cheering erupted as the Terriers bounded across the beach in celebration, clapping each other on the back, and congratulating their teammates on their accomplishments. The rest of the afternoon was spent soaking up the sun, taking advantage of the diving in the clear coral reefs, and just enjoying living 'in the moment'. The Guardian Brigade had moved up on the veranda, their paws propped up, sipping chilled ice juice drinks, one eye on the Terriers on the beach below, and the other eye on the assistant who kept refilling the snack tray in front of them. "Now, THIS is the way to spend a BASH!" Jake commented. As the sun set, the BASH guests retired to their suites, where their luggage awaited them, to dress for the final event of this BASH adventure.... the Birthday BALL! Following a sumptuous banquet, the BASH partiers made their way to the Crystal Ballroom in the east wing of the elegant villa. The adventurers stared in awe at the sheer beauty of the room... then looked upward, and gasped. Hovering overhead were a thousand shining ROBO-ORBS, twirling slowly, and providing a soft, luminescent glow that bathed the elegant ballroom in breathtaking splendor. The gold and crystal adornments in the huge ballroom gleamed with shimmering, sparkling lights. The BASH guests stepped into the center of the huge ballroom... and, in full voice, raised their muzzles toward the heavens... "AARRRROOOOOOOOOOOOOOOOO!" "HAAAAAAAAAAPPPPYYYYYYY Birthday, KATIE WILD CHILD!" her friends cheered. Surrounded, Katie smiled broadly, thanking her many friends for their Birthday Wishes. A full symphony orchestra at the far end of the great room, at a signal from Webber, broke into the "Birthday Waltz". Webber stepped through the throng of well-wishers and extended his paw to "his Katie". Flashing him a smile meant only for him, Katie slipped her paw into his. Webber led Katie out onto the dance floor for her Birthday Waltz. Paw in paw, they danced... the candlelight sparkling in Katie's eyes. With a nod of his head, Webber invited the other BASH guests onto the floor. Couples danced the night away in the soft flickering glow of the ROBO-ORBS. Whispered words were shared, soft laughter was heard, and bold stories of bravery and Scottish adventures were exchanged. And, as the night faded to the soft light of morning, the Bash adventurers wearily made their way back to the waiting ScotCorde. Captain Scotty smiled at each exhausted face as they boarded the legendary jet, and took their seats for the journey home. Captain Scotty lowered the cabin lights as he headed into the cockpit to prepare for the flight home. He knew the Guardians would be there, stretched out in the aisles, watching and protecting. He knew that the Scotties and their friends would soon be curled up and sleeping soundly....and he knew that, once again, no one would EVER believe the tales they would tell. No one ever believed the BASH tales... yet HE knew differently. HE knew the TRUTH! Smiling, he gently sent the ScotCorde racing down the runway, speeding heavenward into the soft, morning glow. So, until our next BASH call, we put this 'virtual adventure' to rest. which make ALL BASH adventures possible! �Copyright 2008 All rights reserved.